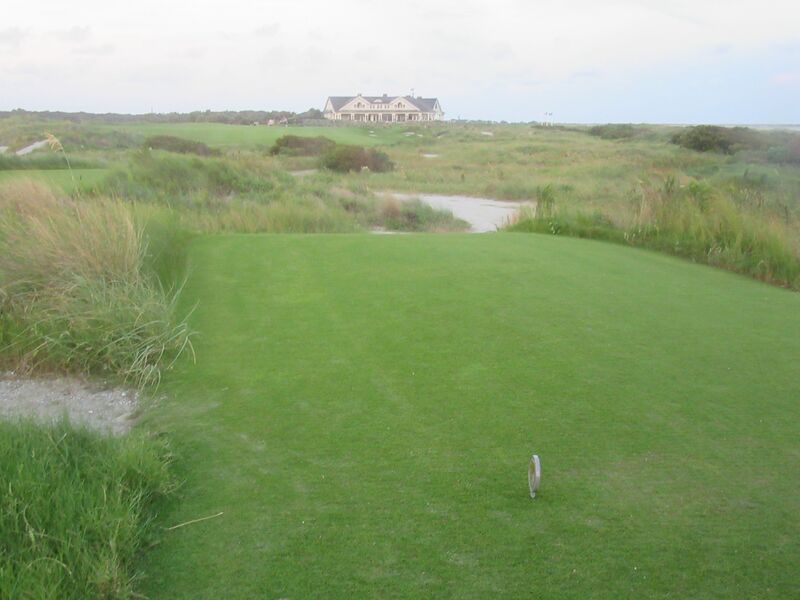 The Ocean course at Kiawah Island Golf Resort has always been a bucket list course for me. As most golf enthusiasts have, I’ve seen it on TV during Ryder Cup reruns, and of course during the more recent 2012 PGA Championship. 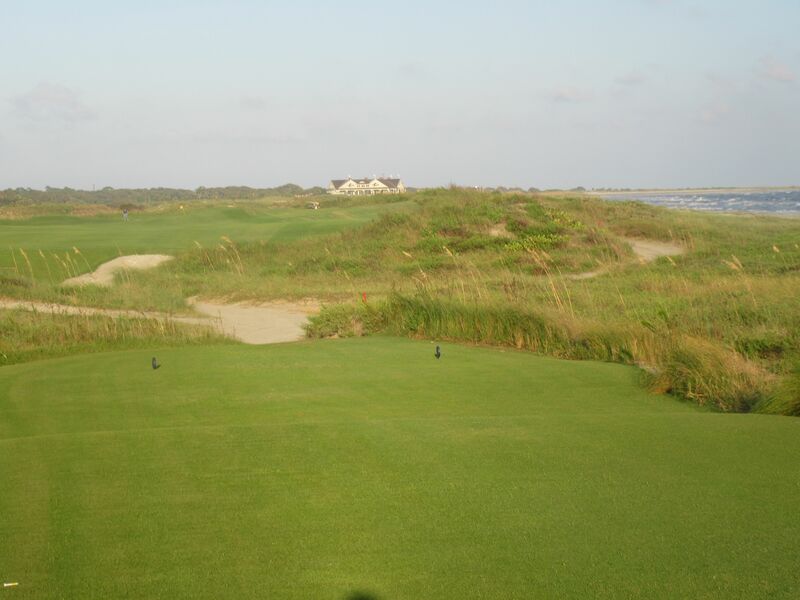 I have also seen it perennially ranked as one of the top five public courses in the entire country. I had heard all the stories about how brutally difficult the course is, how the winds will howl off the ocean at 40-plus miles per hour, and of course more than anything how spectacularly beautiful it is. For me, the course lived up to its billing and more. The amenities at the Ocean course clubhouse were fantastic, especially the Ryder Cup Grille (maybe the best golf course bar and grille I’ve ever been to), the expansive clubhouse and well-appointed locker rooms, and the practice range. 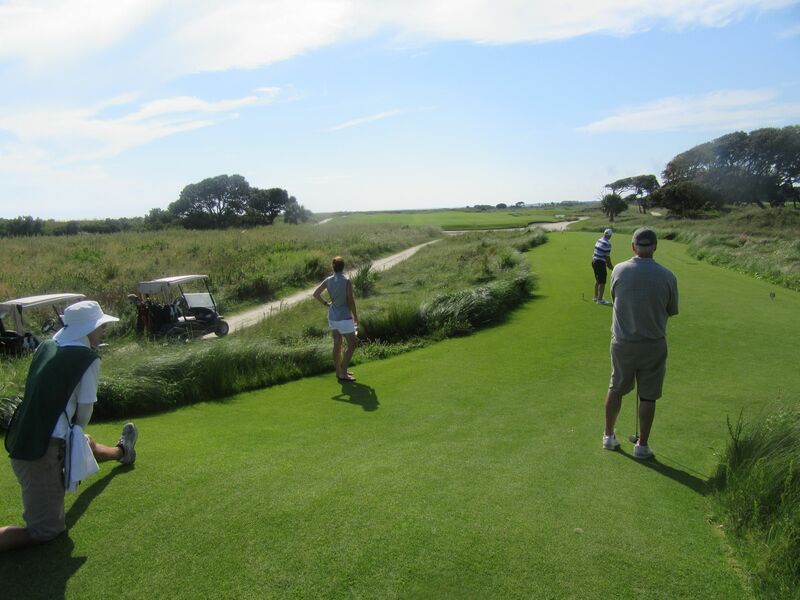 Golfers from around the world visit Kiawah Island for this experience, of course, but what they visit it for most is to walk the same fairways that so many of the game’s legends have also walked… And to gauge their games against what they have seen played professionally. 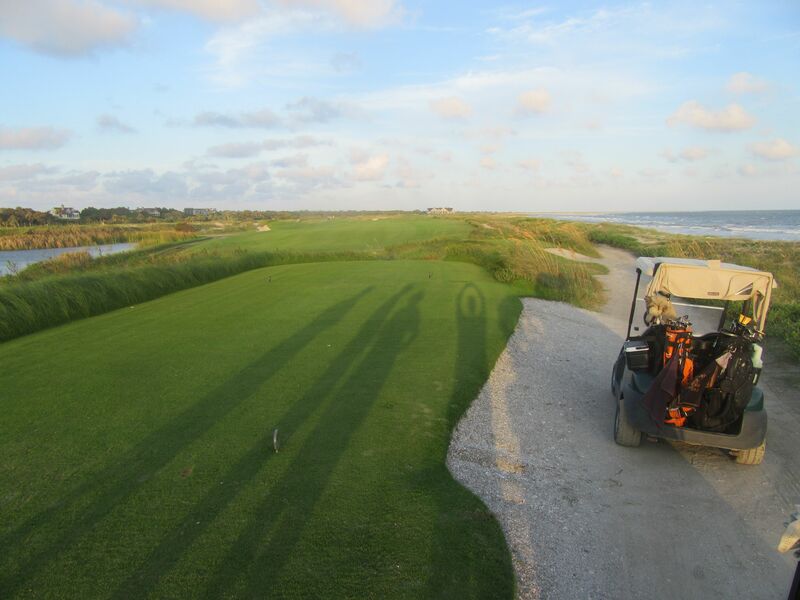 The Ocean course is a walking-only track, although many players take carts along the perimeter of the holes. My new wife (we were in Kiawah Island celebrating our honeymoon), Kelly, joined me for the round and we took a cart and also had a forecaddie, Andy, who did a terrific job as would be expected for a professional looper who has caddied not only at Kiawah Island but also at Bandon Dunes, Streamsong and a number of other world-class golf resorts. I was paired up with Jerry and Paul, who were celebrating Paul’s retirement with a well-deserved golf vacation. We had a lot of fun with these two. 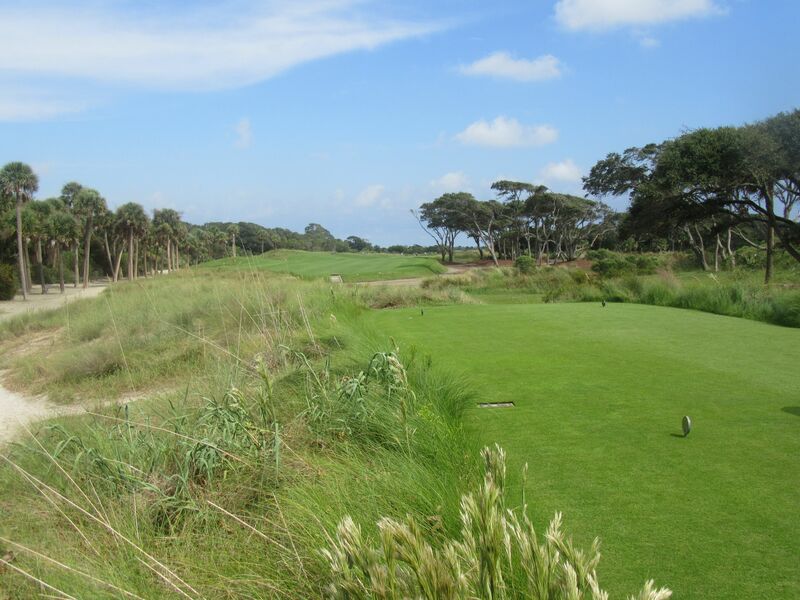 In fact, we were very fortunate during both of our rounds on Kiawah Island for getting great playing partners. Jerry and Paul played from the Dye tees, which measure 6,475 yards and have a slope/rating of 134/72.0. 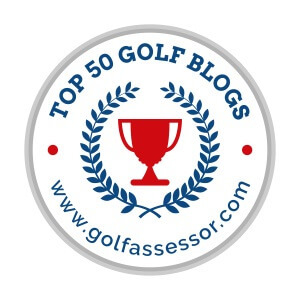 The tips, noted as the Tournament tees on the scorecard, play from a staggering 7,356 yards with a slope/rating of 144/77.3, and is commonly considered to be one of the most challenging rounds of golf on the planet (a 77.3 course rating is astronomical). 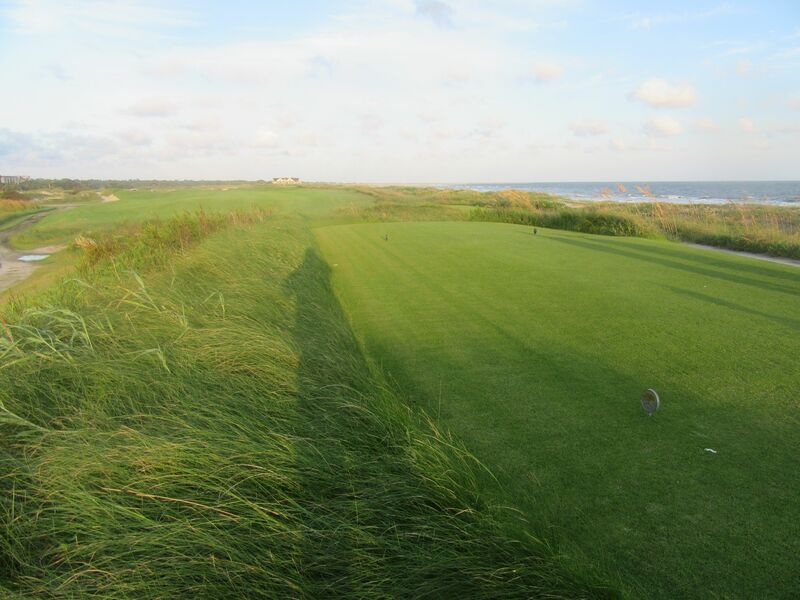 It is not always the length that is so challenging about the Ocean course, although I’d imagine playing from almost 1,000 yards longer would add a considerable amount of stress to the tee shots. Like the Straits course at Whistling Straits, the Ocean course is intimidating off the tee but actually has quite wide and forgiving fairways. 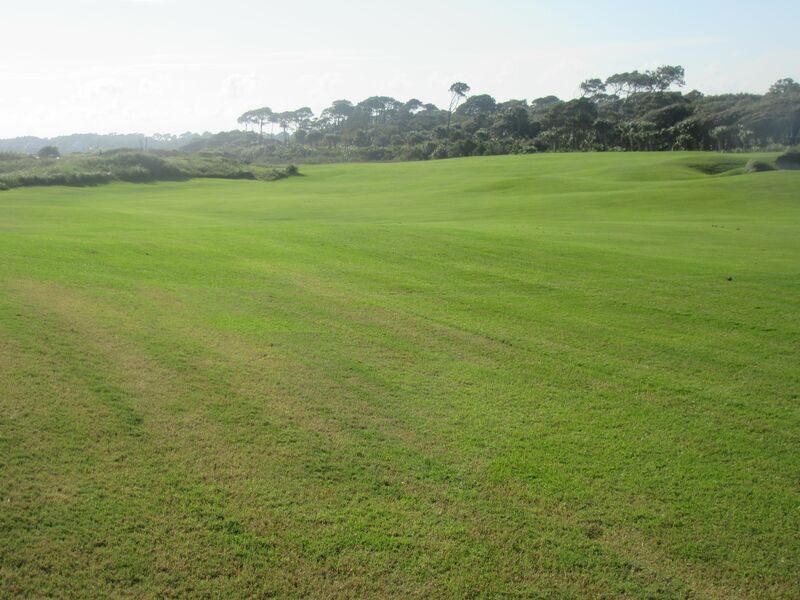 Choosing a line to hit at is a big decision on many holes, and the ever-present wind and long fescue that abounds means precision off the tee is at a premium. 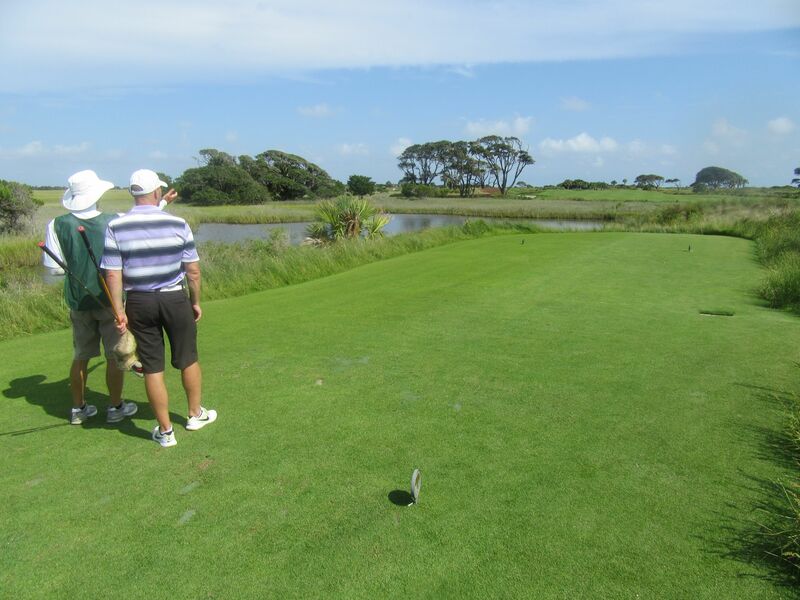 I had my driver going pretty well at the Ocean course, as well as my putter. In fact, if it wasn’t for the second and third holes I would have put together a pretty good round. The conditions were everything you’d expect from a course that charges over $350 per round: There was rarely a blade of grass out of place, and the greens ran beautifully with almost no visible imperfections. The fairways ran out nicely, too, which makes for a fun round when your driver is going straight-ish. 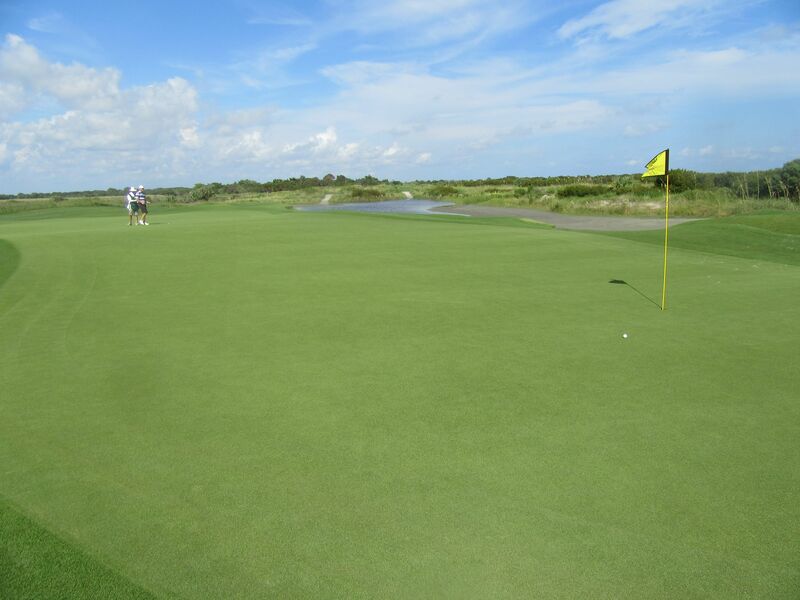 The greens are probably the hardest aspect of the Ocean course. 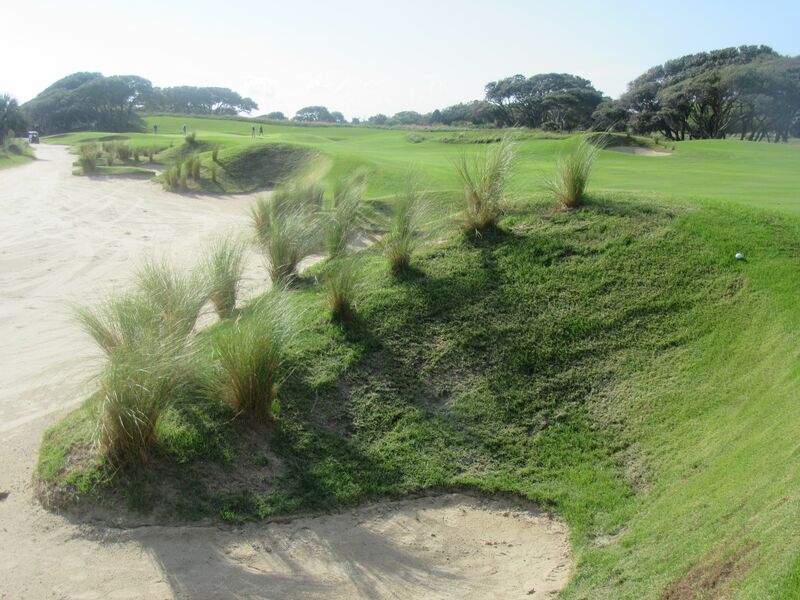 Most are steeply elevated with dramatic run-offs to collection areas and deep green-side sand traps. 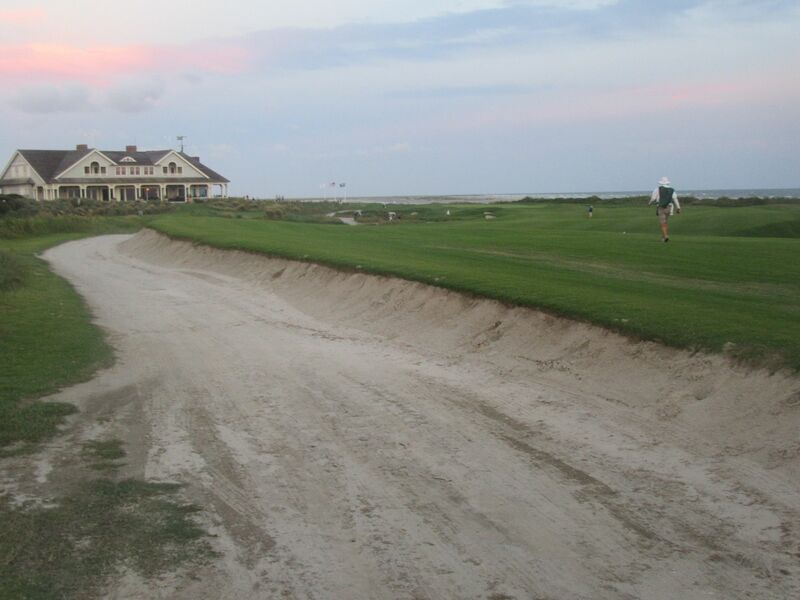 Unlike the 950-plus “bunkers” at Whistling Straits, all sand areas at the Ocean course are played as wasteland. This means that players are allowed to ground their clubs in them, and even take practice swings. 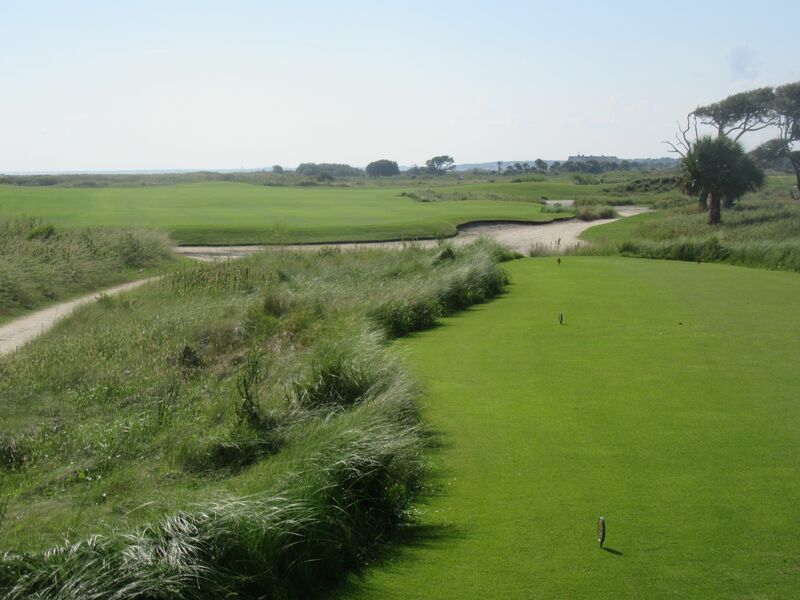 Among its multitude of awards, probably best shown here, the Ocean course at Kiawah Island is maybe best known for the amazing rounds of professional golf that have been played there. Most recently, Rory McIlroy destroyed the field in the 2012 PGA Championship with a cumulative score of -13 including a final round 66, two 67’s and a +3 second round. To gain perspective, second place was England’s David Lynn eight strokes back at -5 and just 20 players in the field of 156 finished the tournament under par. 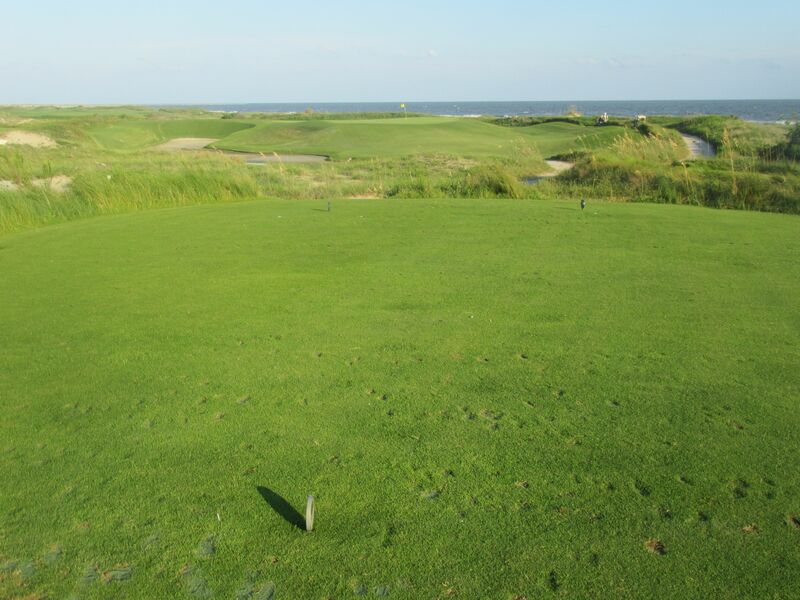 The Ocean course starts out with a beautiful, short par four with a generous fairway. 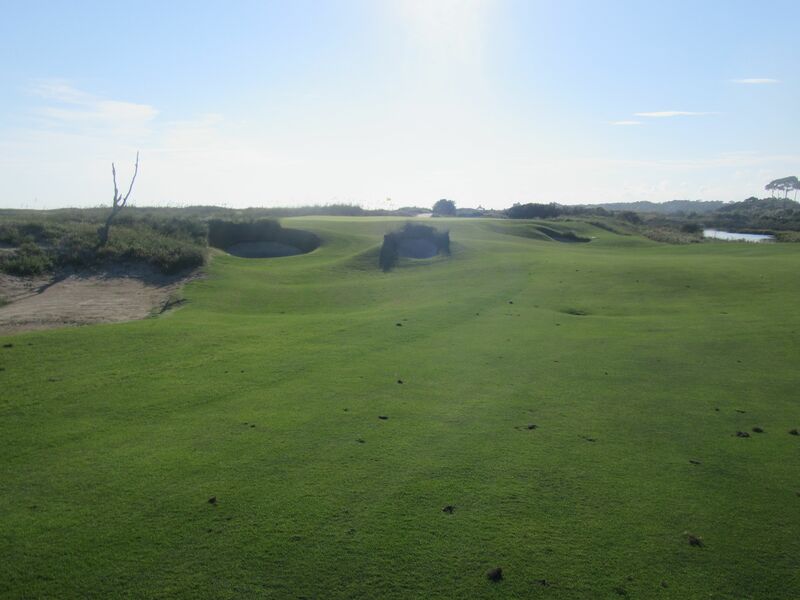 The approach carries a long fairway bunker that runs the right side of the second half of the hole, and the niceties of one of the course’s most subtle greens offers a generous handshake to start the round. 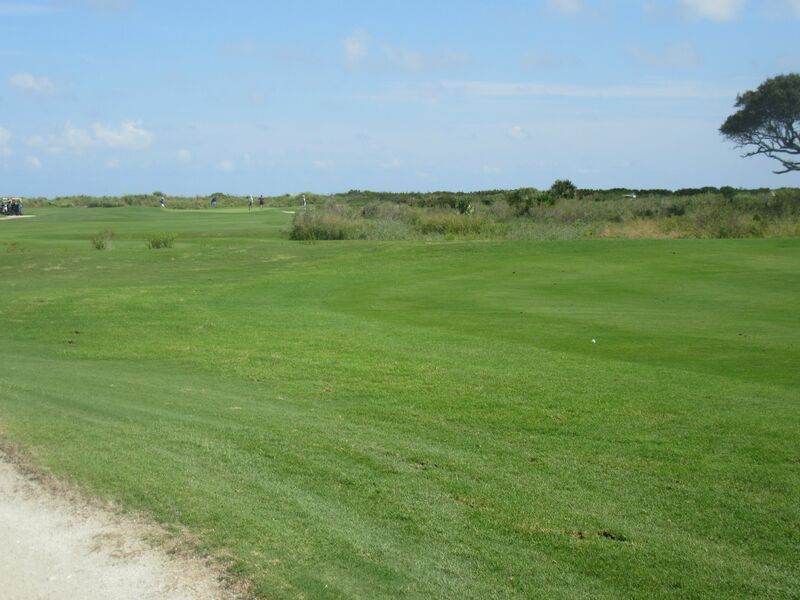 The second and third holes have risk/reward options off the tee: The further a player can drive the ball [with accuracy] toward the left side of laterally running fairways, the less distance will be left to the green. I hit a nice drive on two to the fairway, then made up my mind to lay up with what I thought was a safe 5-iron over the creek that dissects the layup area. My shot carried a bit farther than expected and wound up behind a tree stump and was completely unplayable, leading to a triple-bogey and the first half of some terribly played golf holes. The third is a very cool short par four! 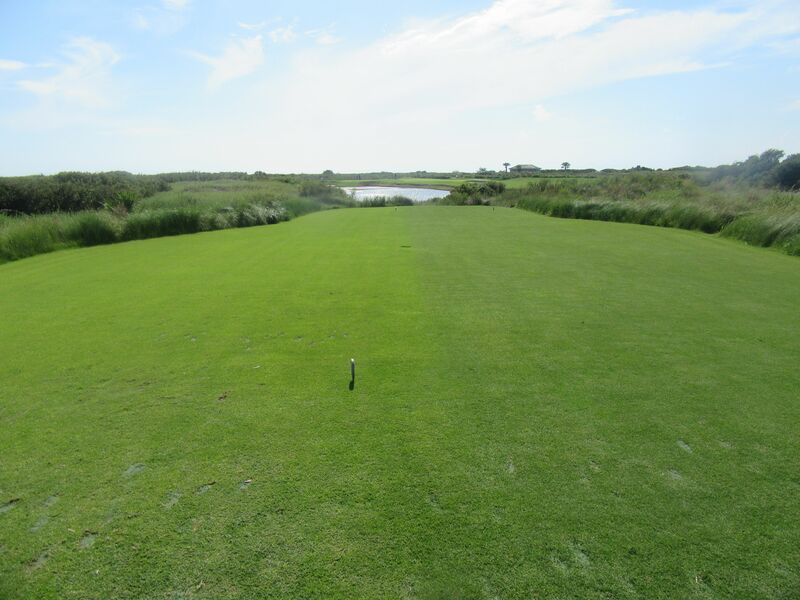 The fairway again runs right to left over a marshland, and the line to hit at is just right of the oak trees on the other side of the fairway. 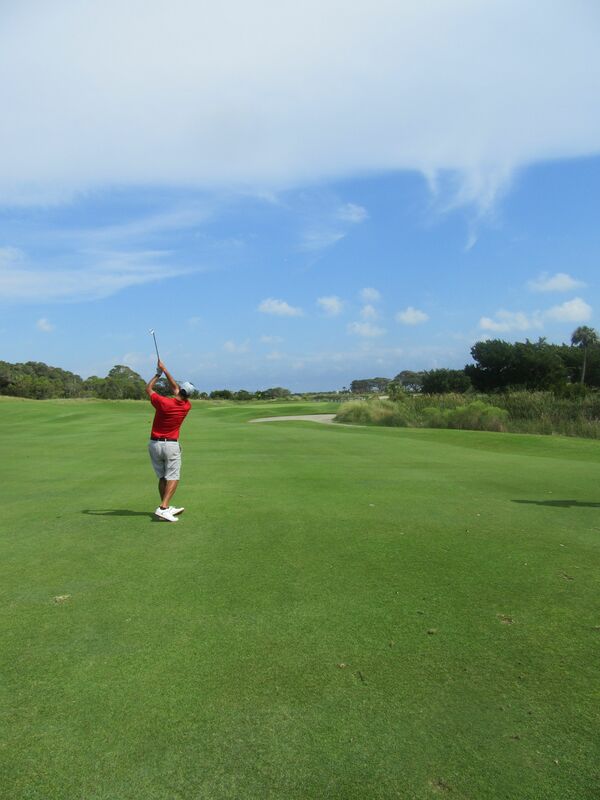 The further left the aim, the longer and more accurate the tee shot needs to be. Although it sets up similarly to the second off the tee, this is a really short par four and the ultimate premium is placed on players’ approach shots. A lone mound lies about 50 yards from the green on three, which is one of the smallest and most penalizing targets I’ve ever seen. This green is tiny from front to back, and with a right-side hole location was a sucker pin if I’d ever seen one. The right play would have been left of the pin, but being 62 yards out and in the middle of the fairway I was feeling confident and hoping to get back one of the strokes I lost on two. Tripling two was disappointing, but what happened on three was nuts: My perfectly drawn tee shot left me in position A. Even though Andy warned me that going at the pin would be tricky, I hit what I thought was a beautiful 60-degree wedge and nearly hit the flag. It then bounced off the green. 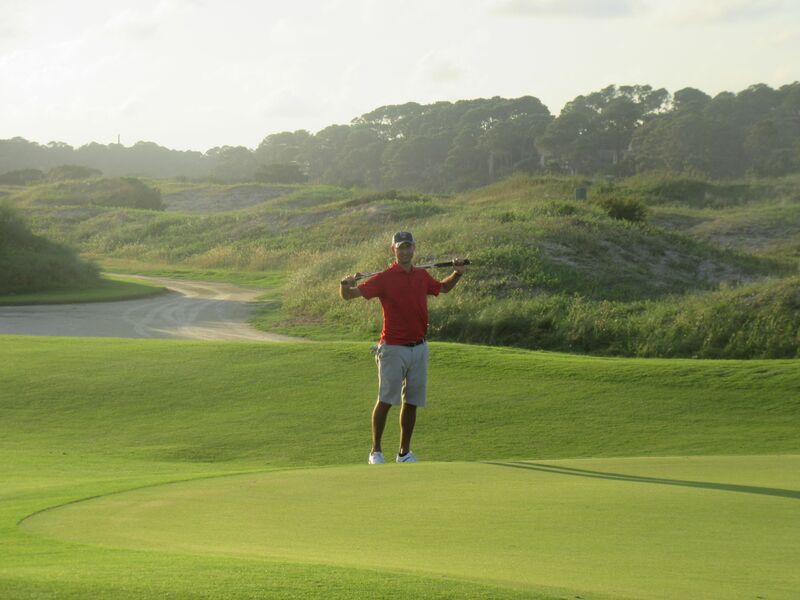 From no-man’s land, I was determined to hit a wedge on to the green… Four times. I also tried putting it up the steep slope once. I finally found the putting surface and two-putted, resulting in a crowd-pleasing five-over (what’s that even called!?) nine. Ouch! 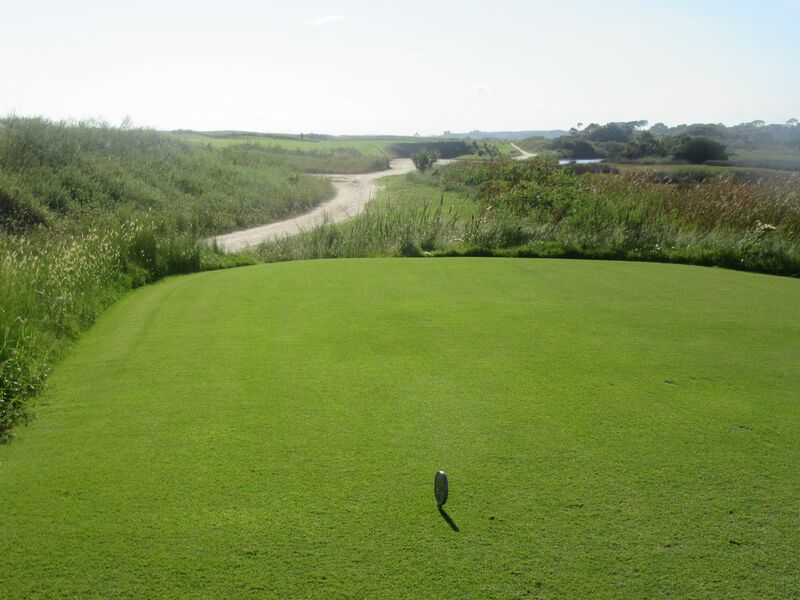 The fourth is a long par four, playing just over 400 yards from the Dye tees and 453 from the tips. 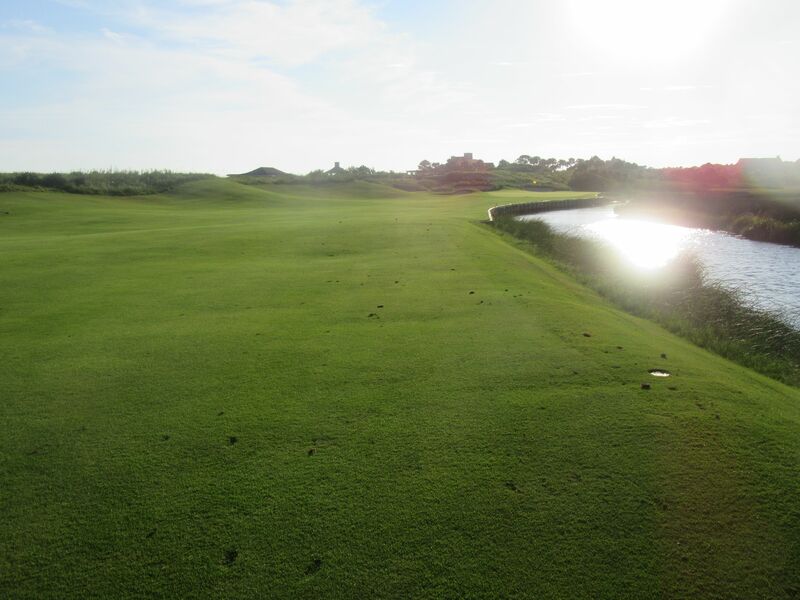 The hole is divided in two fairway areas with marshland separating them, and regardless of how well the tee shot is hit, will undoubtedly require a long and accurate approach shot in. I did not amaze anyone on this hole, taking a double-bogey, but at least that was better than the eight-over I’d scored on the previous two holes (+10 on three holes, though? 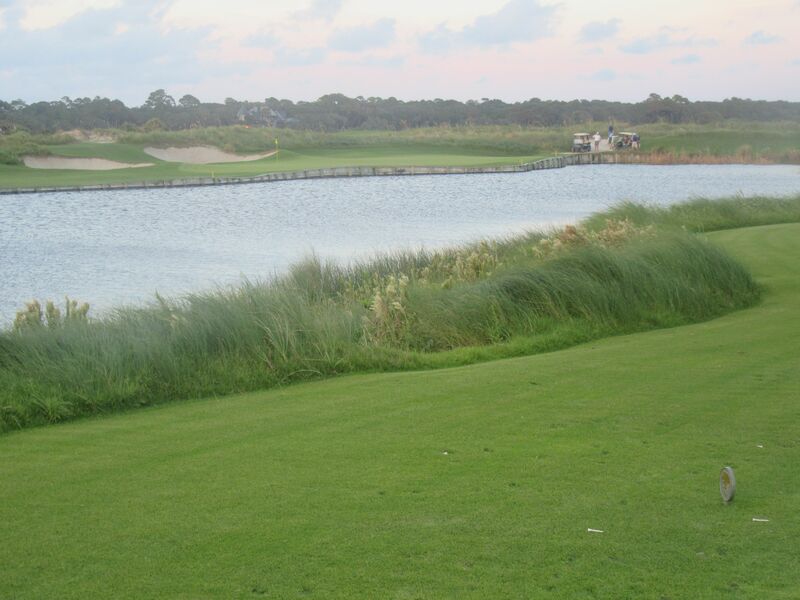 Wow, this is not your average golf course!). The fifth is a tough par three over water with a long horizontal green that gets longer as it slants from the front-right to back-left. This hole plays 207 from the tips, and is all carry with no room to miss long. 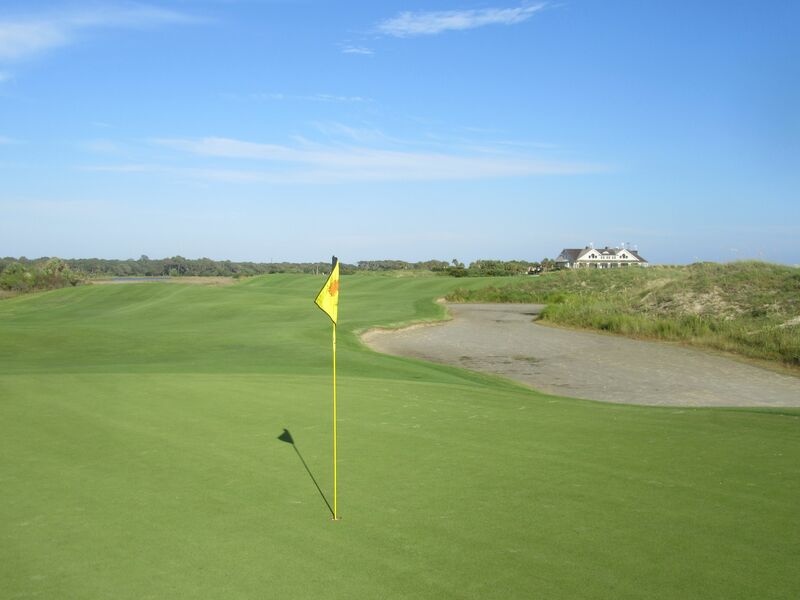 The 10,000-plus square foot green allows plenty of room to bail out right, so club selection versus the wind is key while hitting the wrong side of the green complex will lead to a ridiculously long and challenging two-putt for par. With a back-left pin and the wind blowing hard from that side, I was between clubs and decided to try hitting a drawn five-iron toward the middle of the green [in hopes it would hook left, which is never a given!]. It actually did, landed a couple feet from the hole and rolled to about five. It was a straight-forward birdie putt that I made. Phew, back on track. 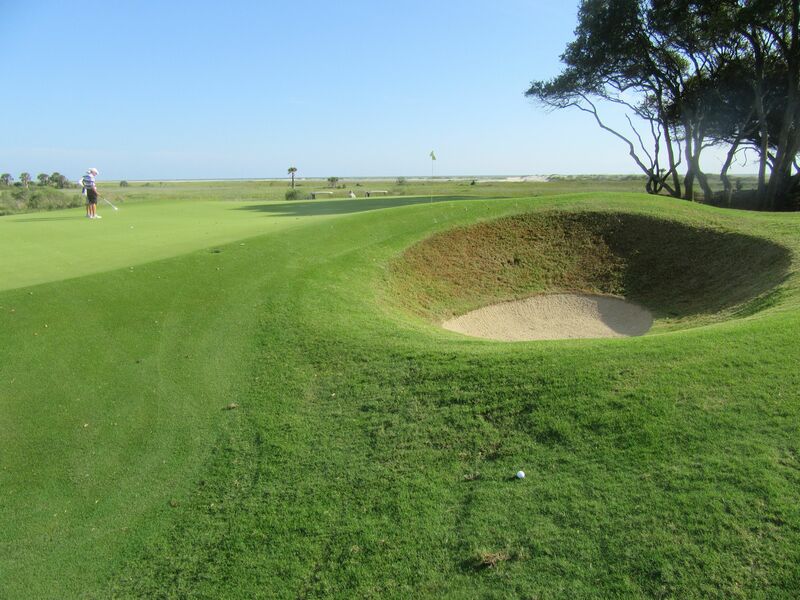 Six is a tough driving hole, playing over a massive waste bunker and in to the wind during our round. 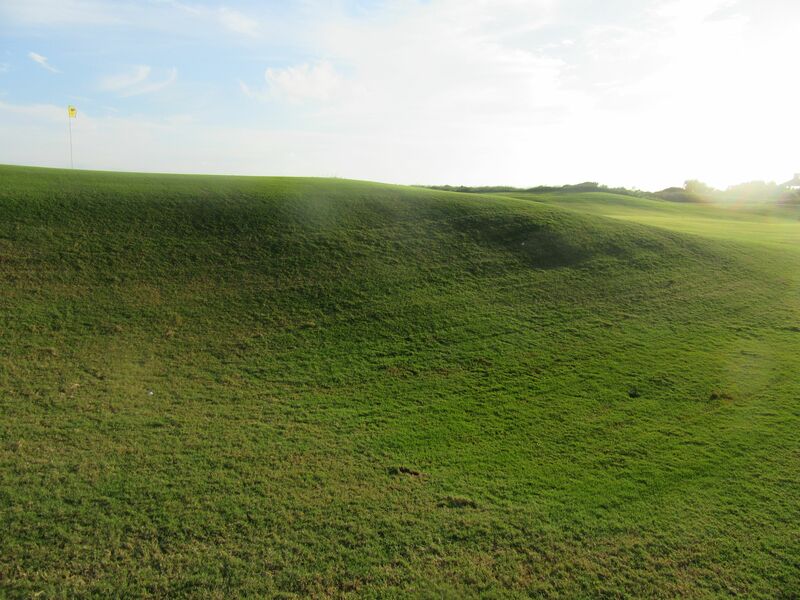 A draw is the preferred tee shot, as anything hit long and right will find wasteland while anything hit short and left will find a deeper one. The green on six is level to the fairway, and a bunker on the left side of the green is the only hazard to avoid on the approach. 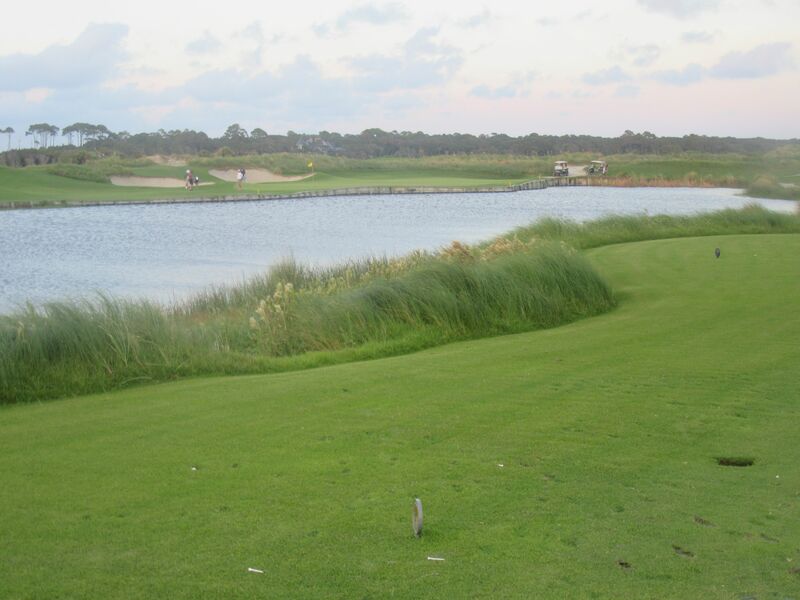 The seventh is a short and score-able par five. With the wind still in our faces, the left-middle section of the fairway was our target as biting off too much of the elbow in the fairway was inviting disaster. 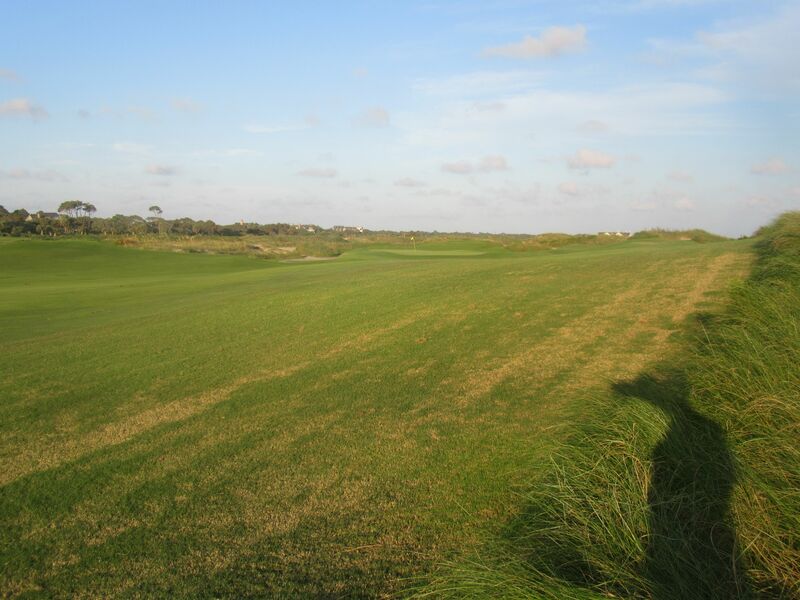 The fairway doglegs left to right at about 230-250 yards from the Dye tees, with deep fescue protecting the corner. 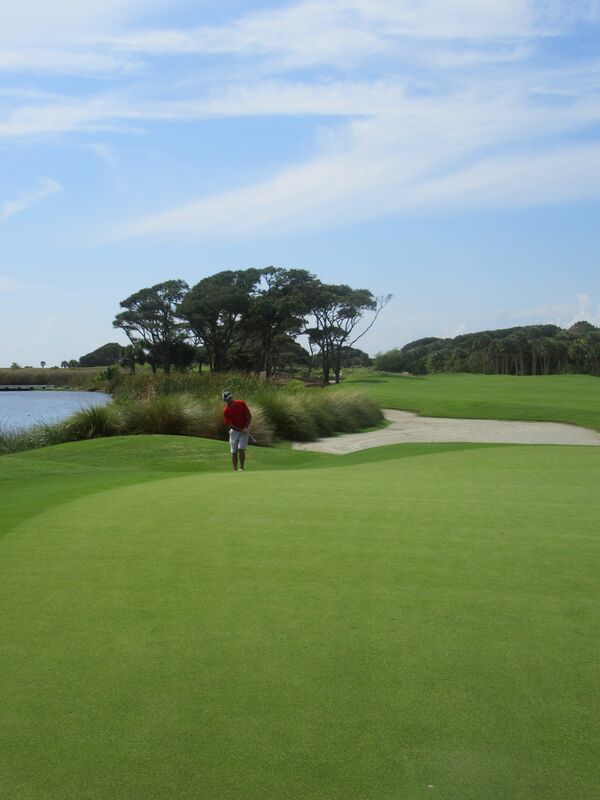 The short grass then runs straight about 260 yards to a slightly elevated green with sand enveloping the right side. I hit the ball hard off the tee, but it had some cut and we spent a few minutes trying to find it in the fescue. I hit a provisional and then heard Andy yelling to me to grab a club as my original tee shot was in the middle of the fairway well past the elbow. I immediately went from hustling for a bogey to salvaging bird – this was becoming an interesting round! 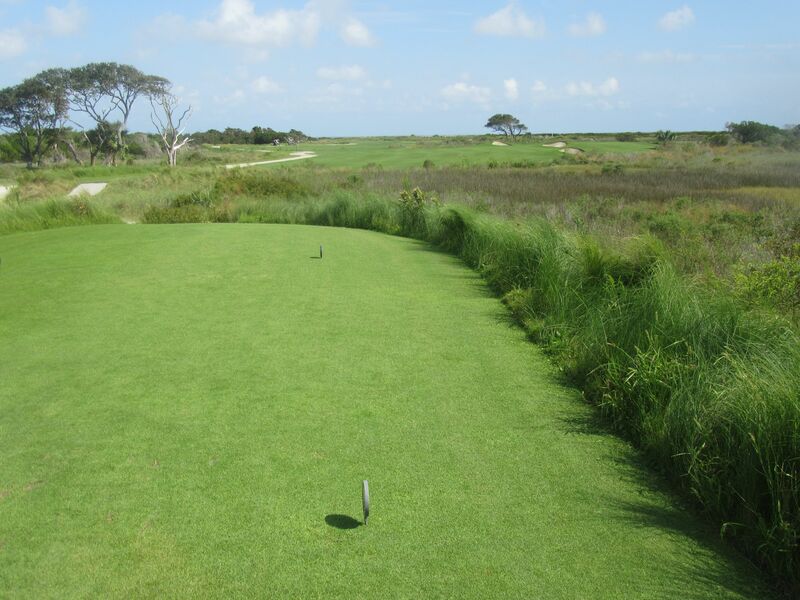 A mid-length par three, the eighth demands accuracy. Sand abounds short, right and long of the target zone, and a mounded green means anything slightly off will kick off the hill and find sand. 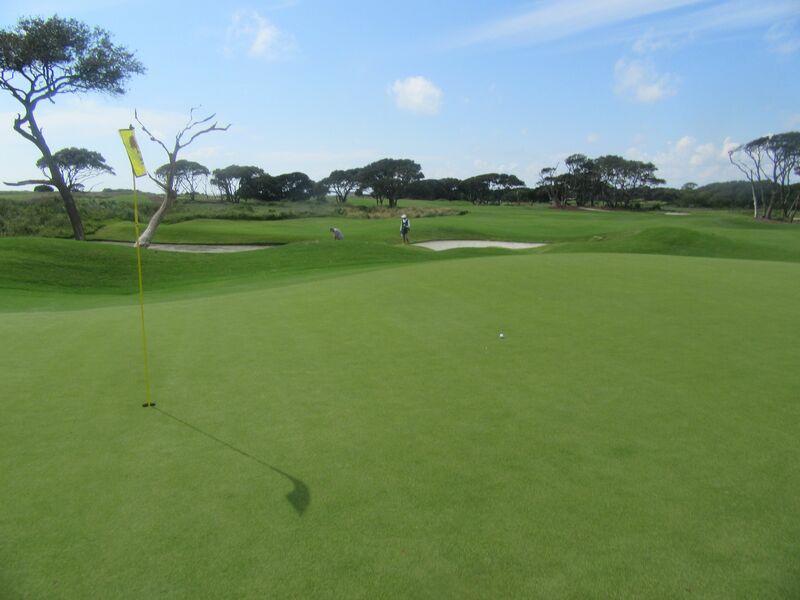 There are a lot of contours on this green, so the most important shot here is the second to ensure par. Nine is a crazy par four. 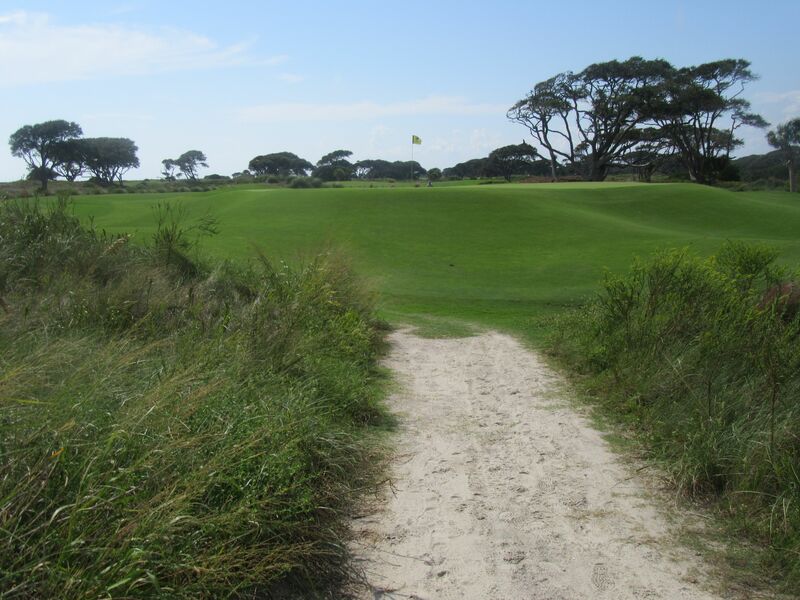 At 464 yards from the tips and 406 from the Dye tees, the fairway runs right to left with sand owning the entire left side of the hole (this is “Cart path” for the Ocean course). The traps on the left elbow of the fairway need to be avoided, while the right side of the fairway funnels slightly toward the middle. Distance off the tee is the key ingredient to nine, as the approach is bound to be long but at least a 5-iron in is easier than 3-wood! 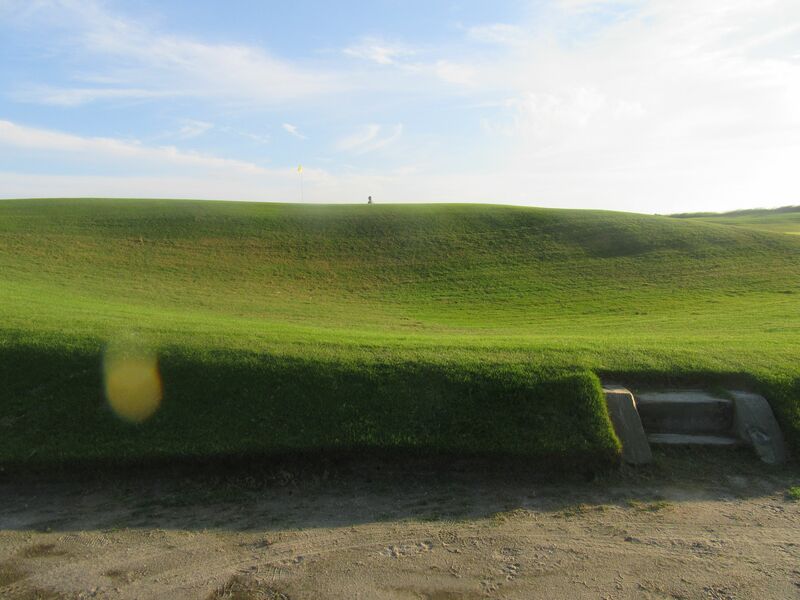 Massive pot bunkers are found both left and right of the green complex, although the elevated putting surface has nothing guarding the front (mercifully). The back nine starts out with a mid-range par four that runs left to right. 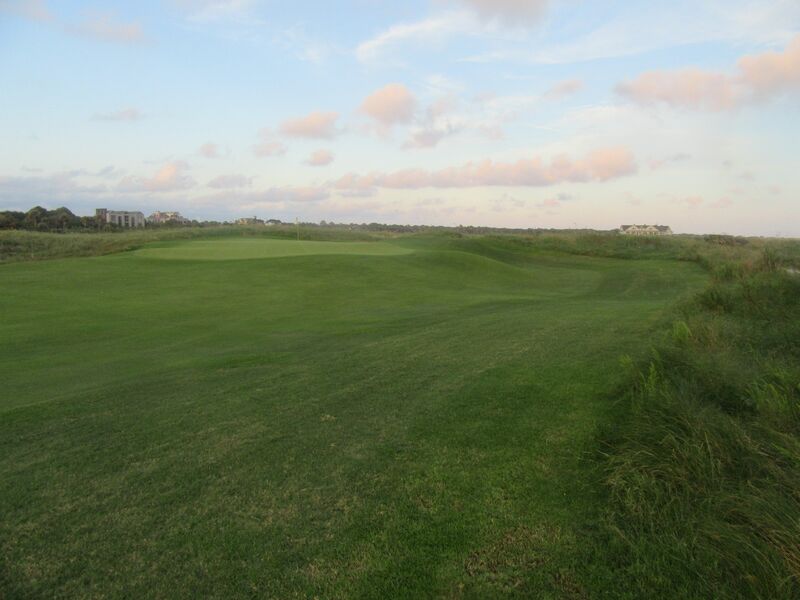 The fairway falls slightly downhill with wasteland on the left, and a deep bunker looms in the back-right of the green. 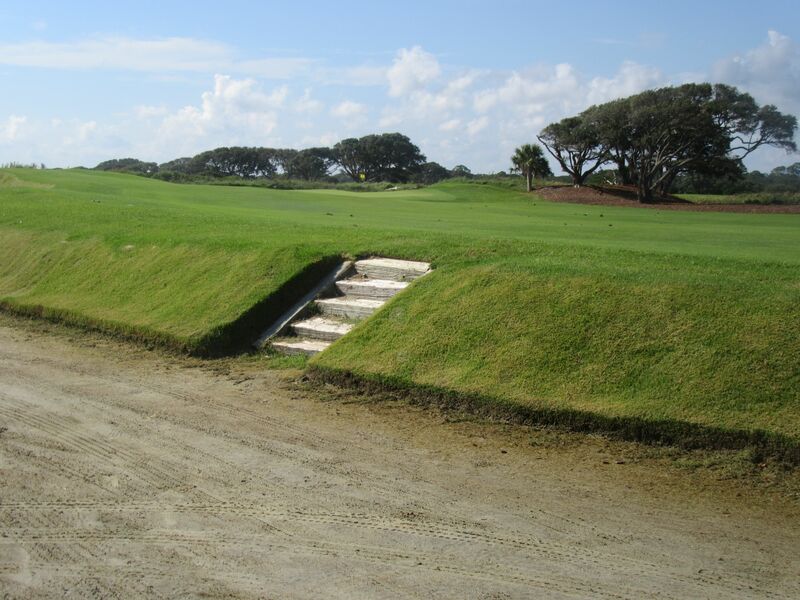 The eleventh has one of the most visually intimidating sand traps on the entire Ocean course toward the right side of the fairway driving zone. Stay away from it, obviously, and set up the second shot well right in the shoulder that leaves 100-125 yards out from this highly elevated green. Brutal pot bunkers guard the front of this par five’s putting complex, which is bean-shaped from front-left to back-right. There is nothing easy about this hole and course. 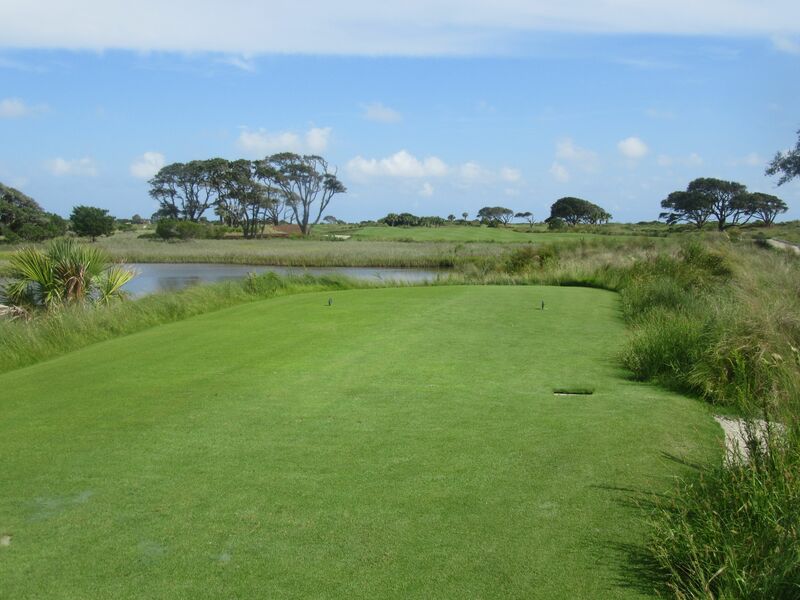 In to the wind, especially, the par four twelfth is a ridiculously challenging golf hole! 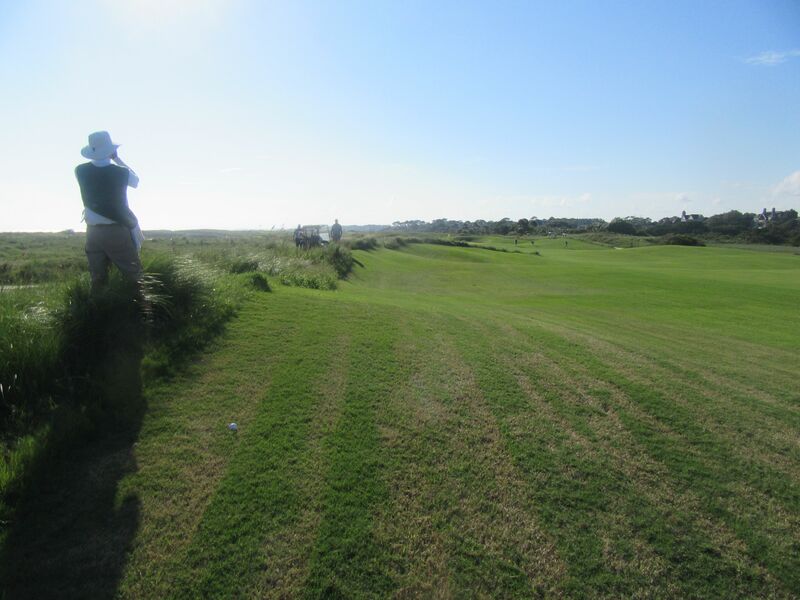 While the fairway is one of the widest on the course, there is nowhere to miss on the approach shot. 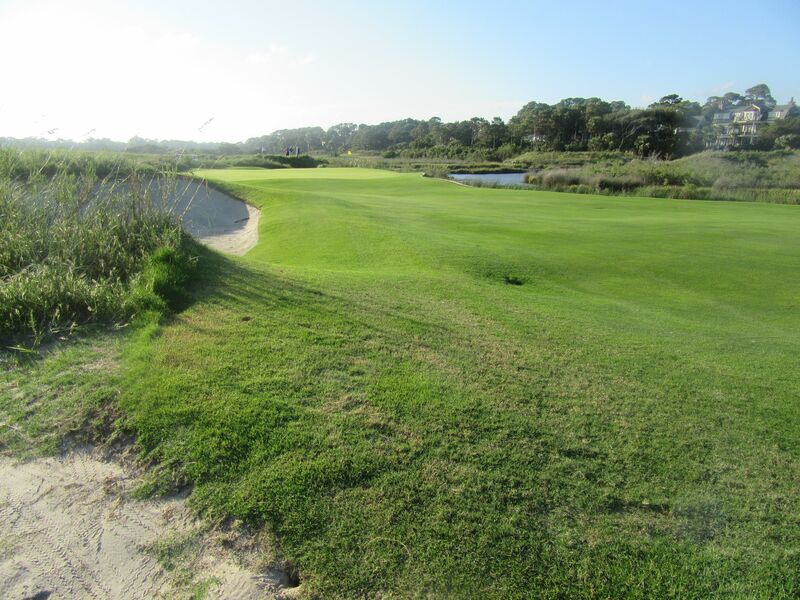 Water runs the entire right side of the approach area, and tight sandy lies make up the left. 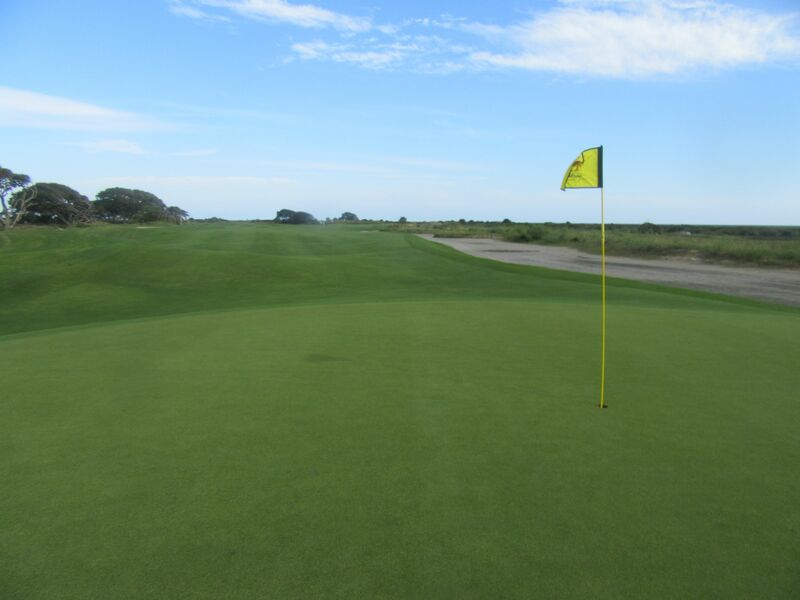 The green is small-to-average sized, but all the water and sand make the approach shot quite stressful. 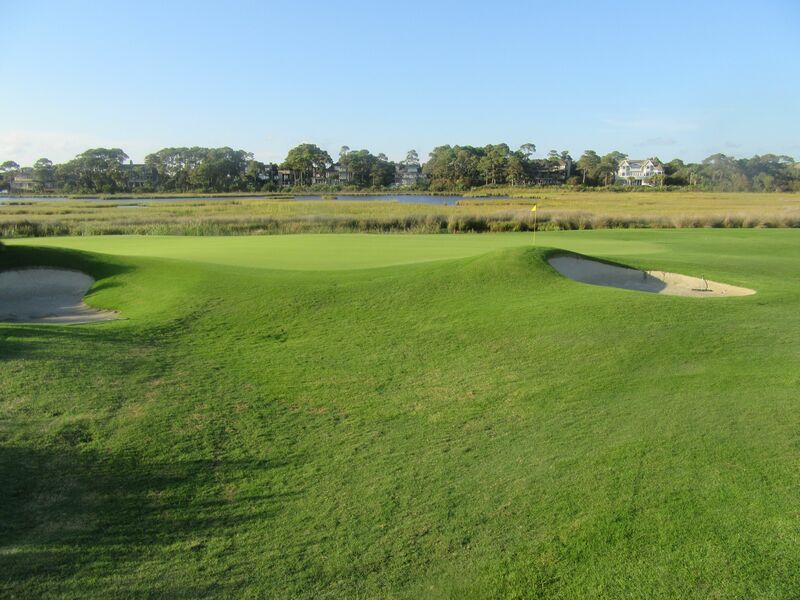 Traps on the front-left and left portions of the green, and a putting surface that runs along the water make the approach shot incredibly important here. As you can tell by the flag on the following photos, the wind was howling off the Atlantic by the time we got to 14. Playing to 161 yards from the Dye tees (194 from the tips), this par three is similar to the eighth in that anything even slightly off will not hold the green and leave players scrambling for an up-and-down. 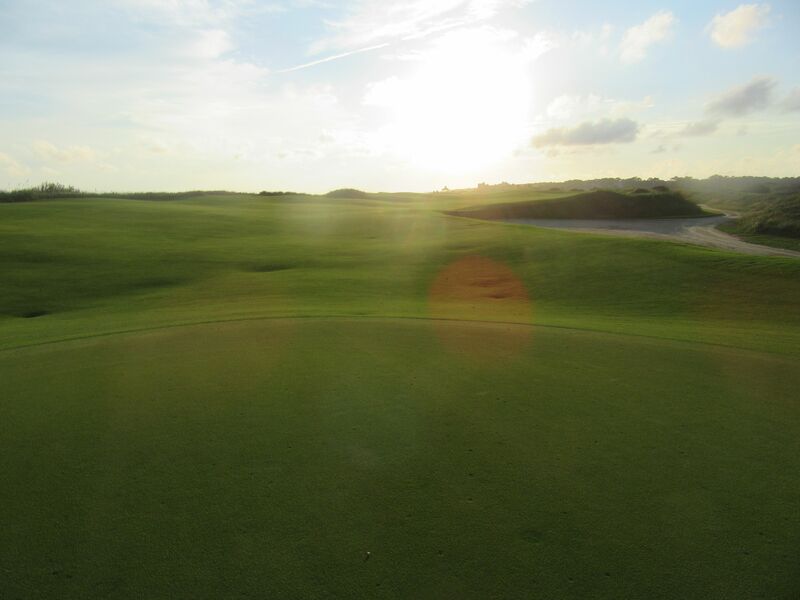 Fifteen is the first hole truly adjacent to the Atlantic on the Ocean course. 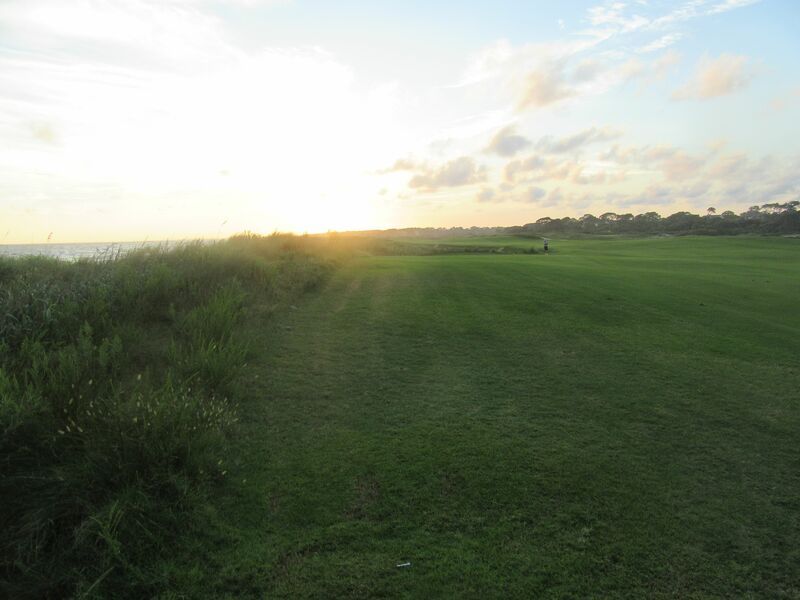 The wind was roaring off the ocean, and with the sun starting to set the views back to the tee boxes were stunning. The tee shot, at least partially because of the right-to-left wind influence, was all systems go. The green, on the other hand, presented more of a challenge. 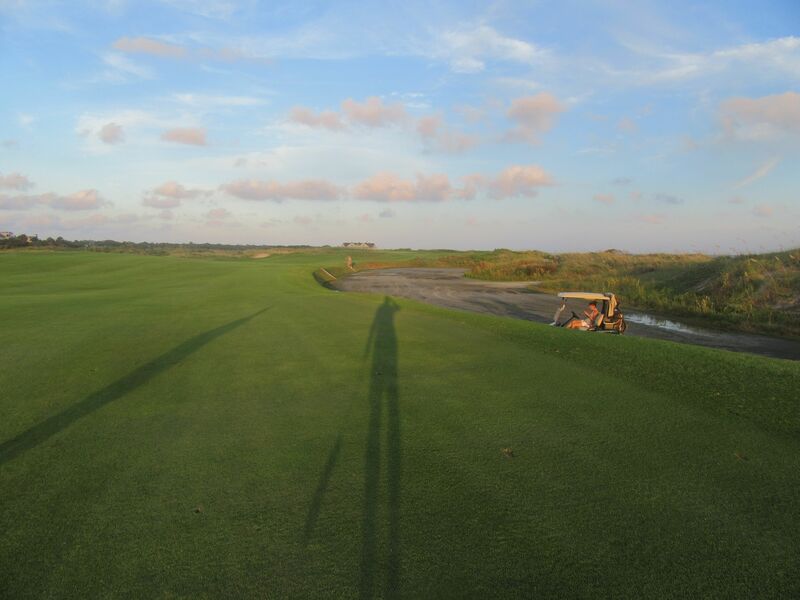 Sand runways occupy the left side of the approach area, and the putting surface runs from front-right to back-left, slightly uphill and atop the waste area. 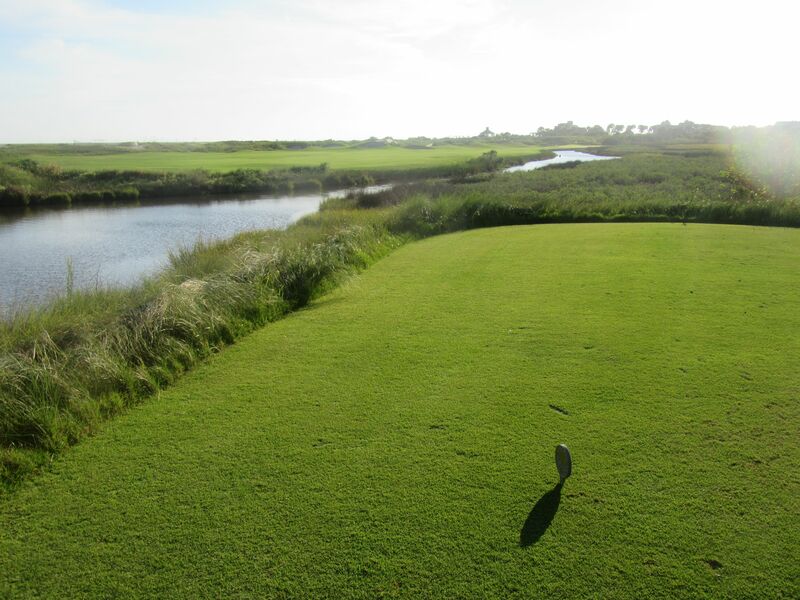 The final par five on the Ocean course, the sixteenth is a long 579 yards from the tips and 540 from the Dye tees we were playing. A pond has to be carried from the back tees, but should not come in to play. 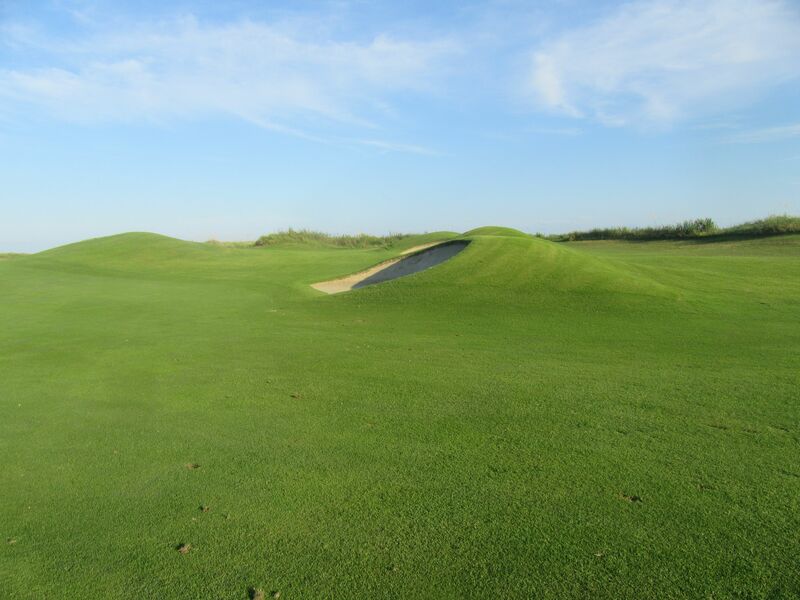 A deep sand reservoir runs the right side of the hole’s layout starting at about 300 yards, and along with the wasteland on the left side of the final third of the hole makes for a narrow setup shot. 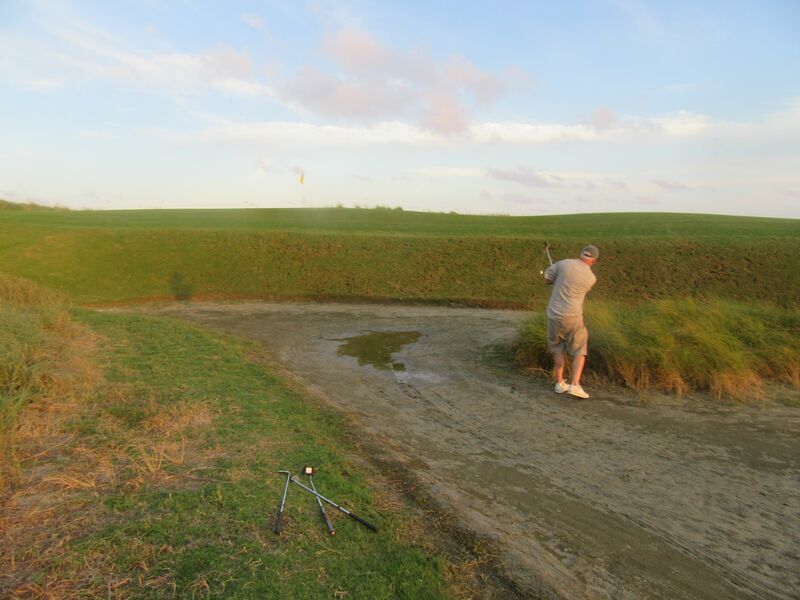 If in doubt, keep the approach shot right to avoid the green-side bunker short-left. I felt bad for Paul with the sand shot he had to deal with (shown below)… That one was next to impossible. The seventeenth is a pretty famous golf hole. 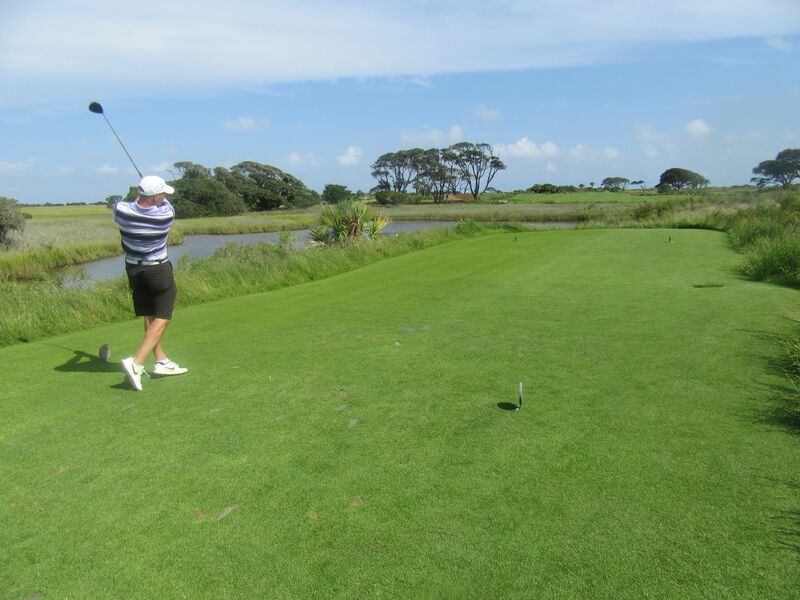 Teeing up away from the ocean, it is all carry over the pond and makes for a tight target area. 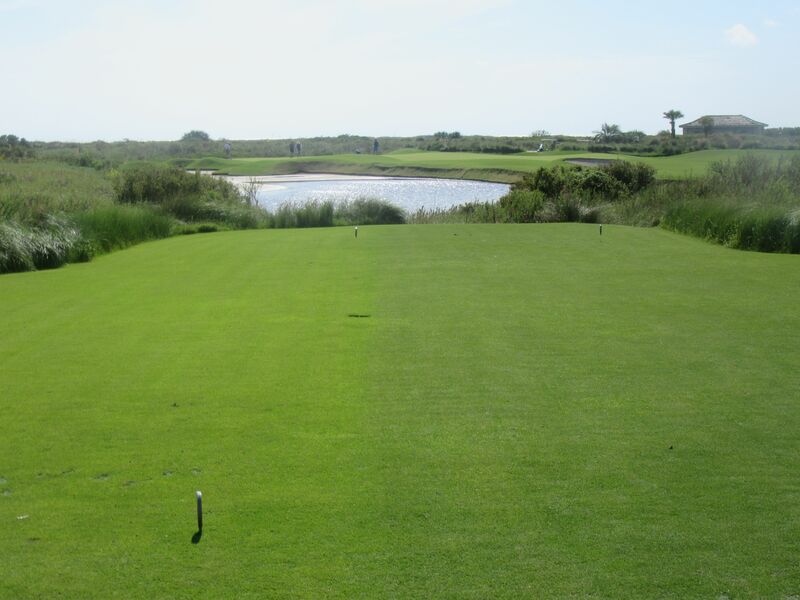 With the hole cut on the left side, it is tempting to take on the green-side traps on that side, but probably the safest play is adding a club and aiming for the middle of the green. We had a ton of wind at our back, making 170-ish yards more like 130. 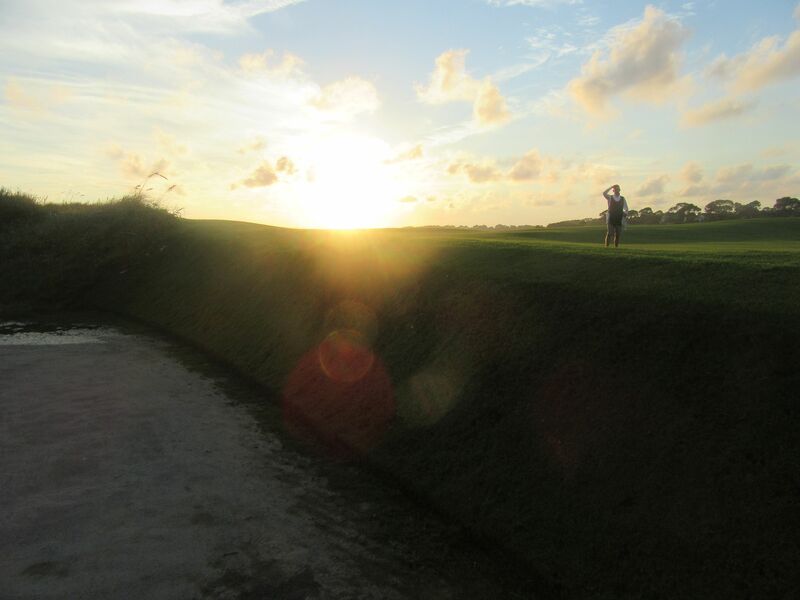 I hit 9-iron and barely carried the pond on the right side, leaving a 50-plus foot putt with the sun going down. 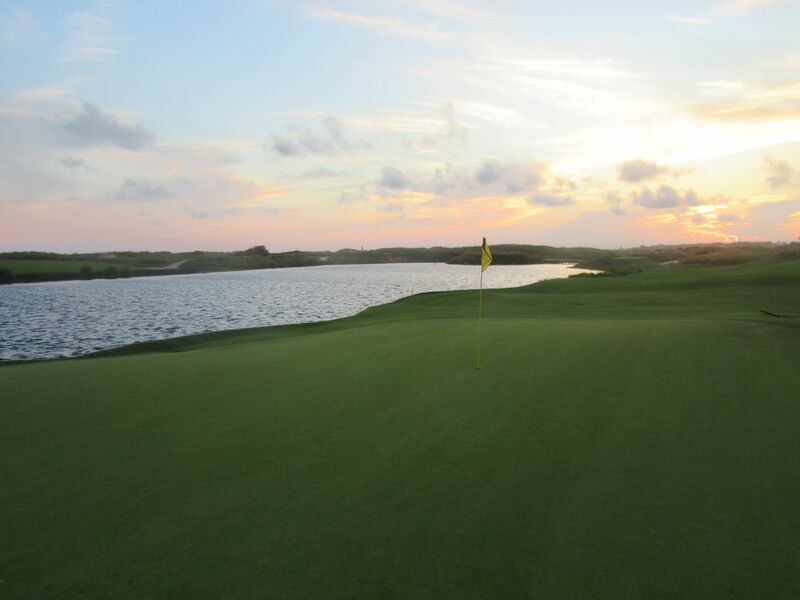 This is a gorgeous golf hole, and one that works well with the Ocean course’s world-class tournament pedigree: Feast or famine plays well with fans when championships are on the line! 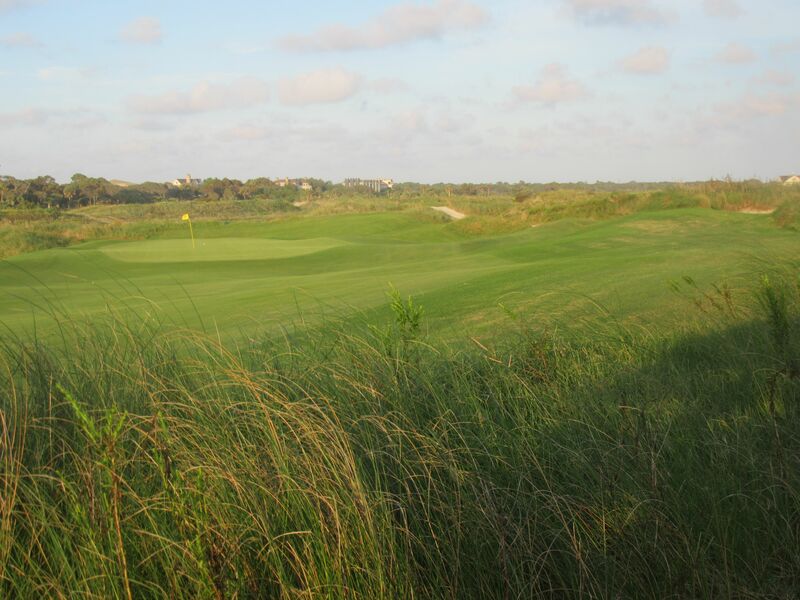 The eighteenth is a challenging finishing hole at the Ocean course. 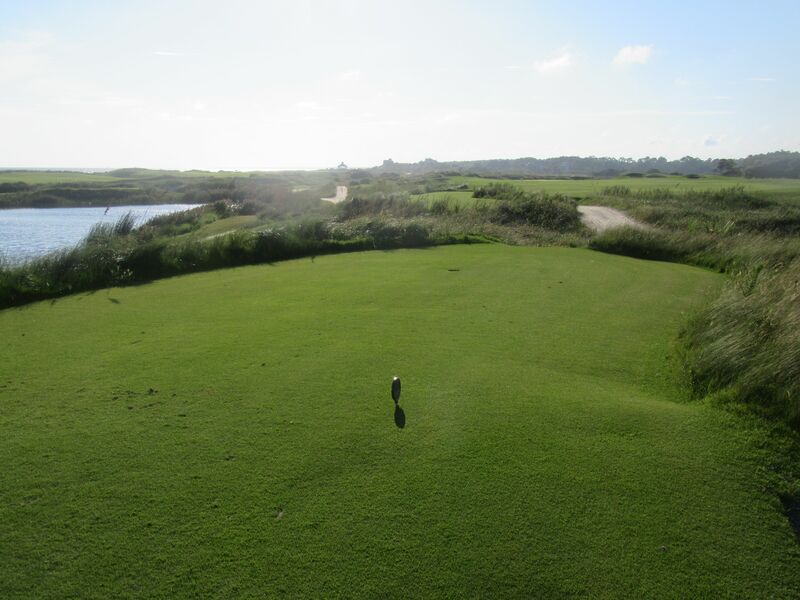 The tee shot is visually intimidating with the Atlantic Ocean to the right and wastelands in play both on the left and right sides of the driving area. The left side of the clubhouse can be targeted off the tee. 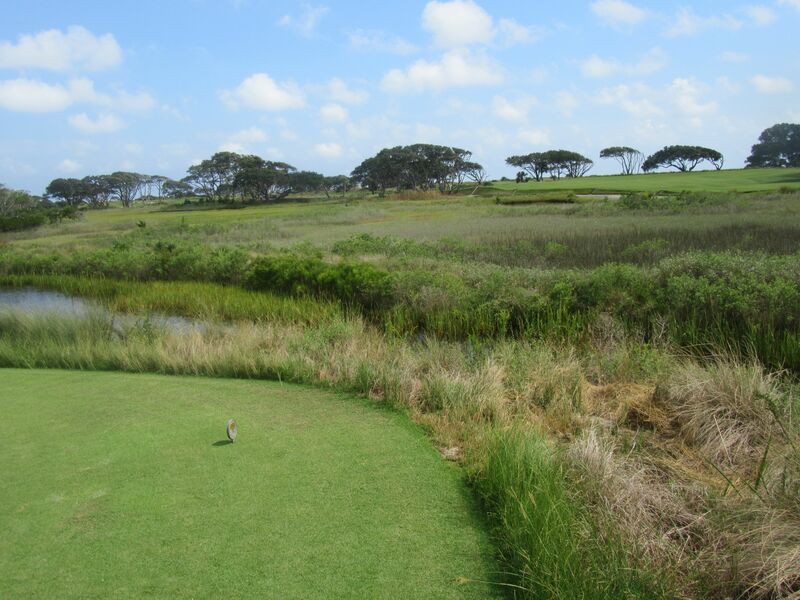 Find the fairway and heed caution on the second shot to set up a chance for par. 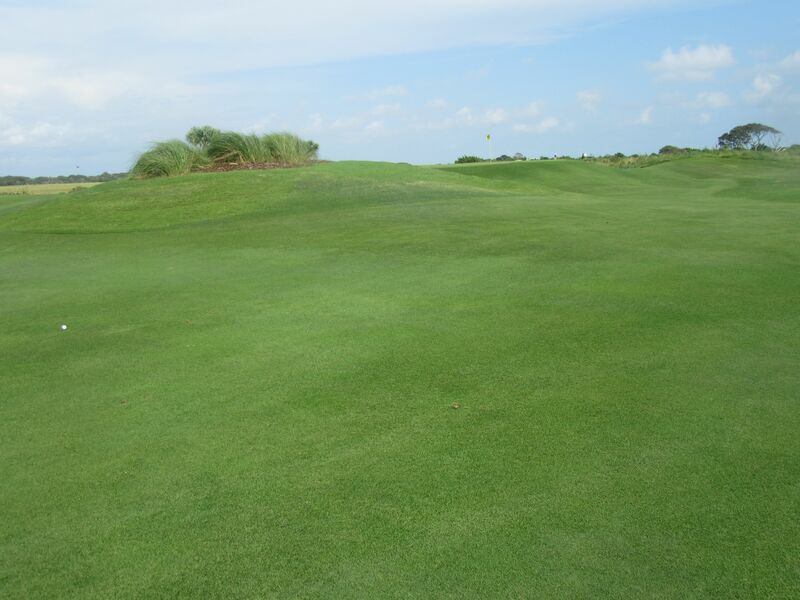 Short-left of the green complex is deep, deep wasteland with intermittent patches of fescue that if found will likely add a stroke or two to your score, so caution is the name of the game. Playing 439 yards from the tips and 396 from the Dye tees, the eighteenth is a great, great golf hole to end your round on this fabulous Pete Dye course. After the eighteenth, make sure to find your way to the Ryder Cup Grille out back of the pro shop. 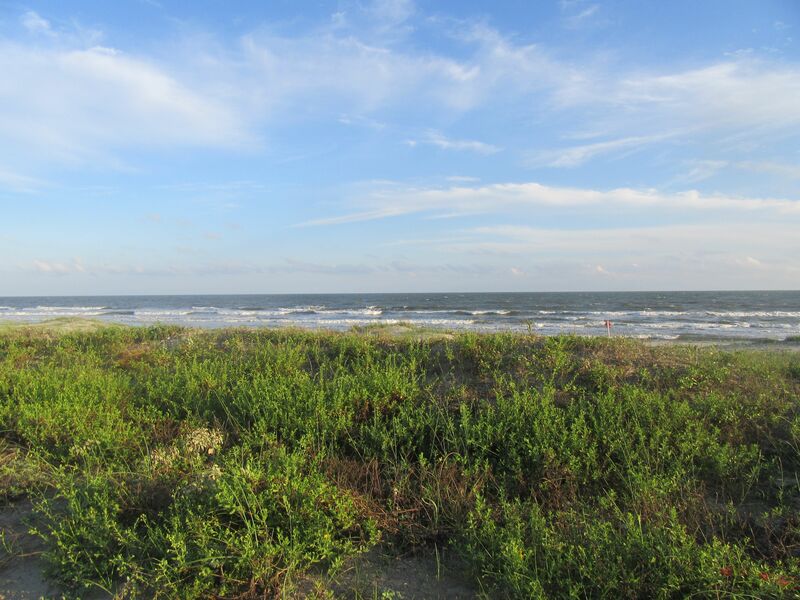 The RCG has fantastic food and drink specials, not to mention some of the most captivating views found anywhere. 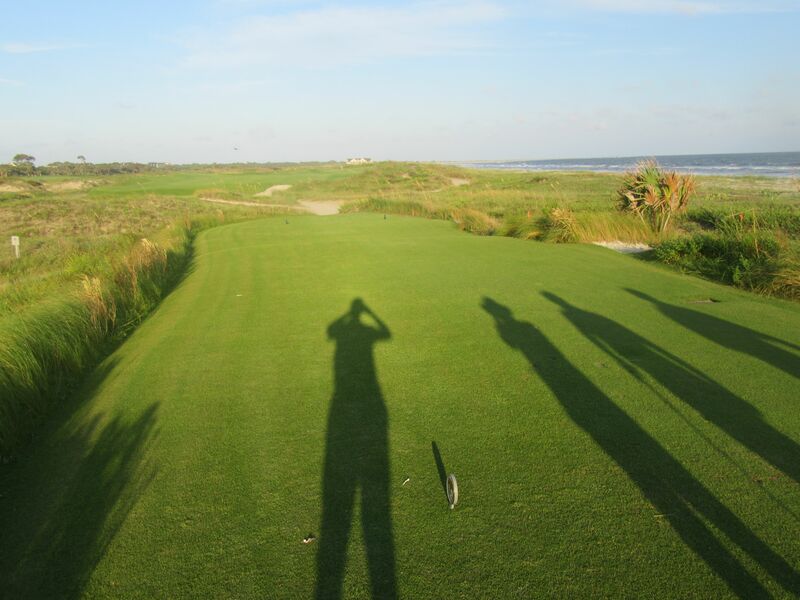 My excitement to play the Ocean course at Kiawah Island was really high in the weeks leading up to our honeymoon, and that always worries me that the experience may not live up to my expectations. 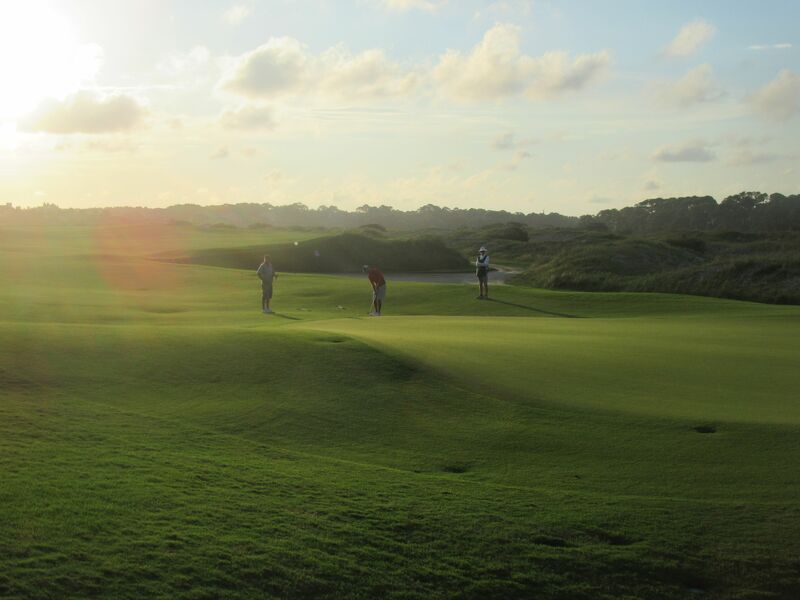 It’s wonderful when a course with these high expectations pans out, and the Ocean course at Kiawah Island did. 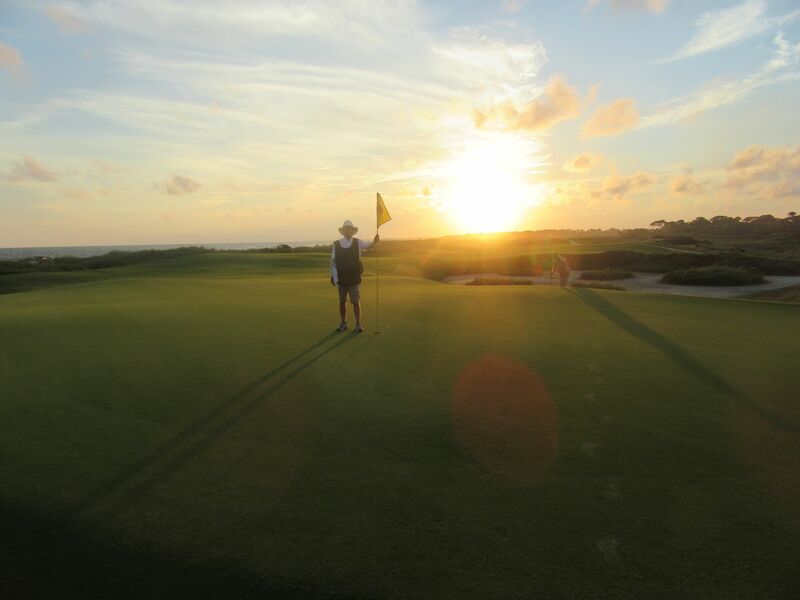 Between the pristine conditions, world-class service and some of Pete Dye’s most ingenious hole layouts, every hole on the Ocean course was fun, challenging and scenic. 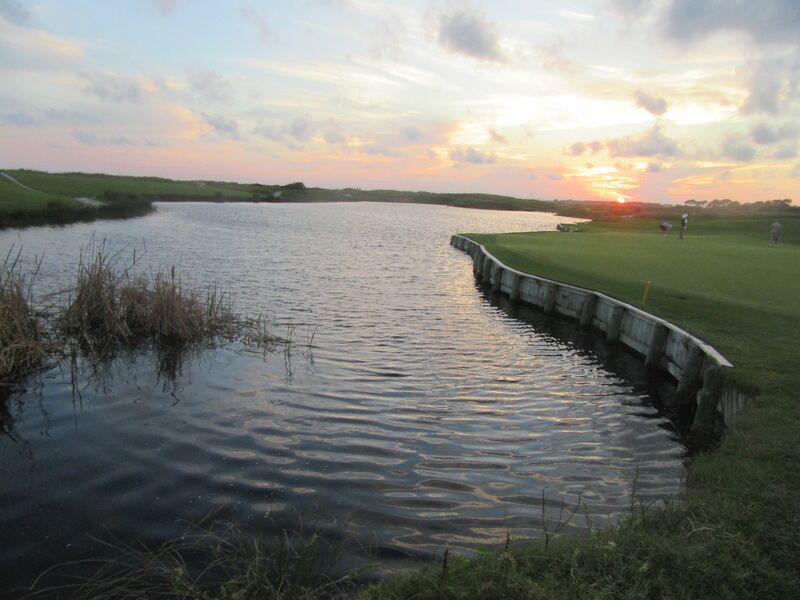 “What would you compare the Ocean course to?” my friends asked when we got home to Wisconsin from our honeymoon. It should come as no surprise that the nearest comparison for me is the Straits course at Whistling Straits. 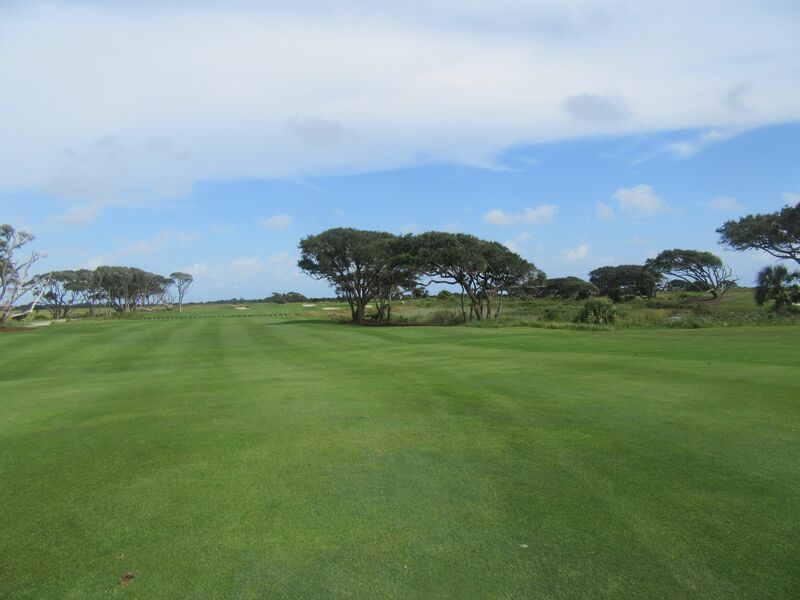 Both courses feature intimidating tee shots, wide fairways, a satisfying combination of large and small greens and a terrific variety of hole layouts. 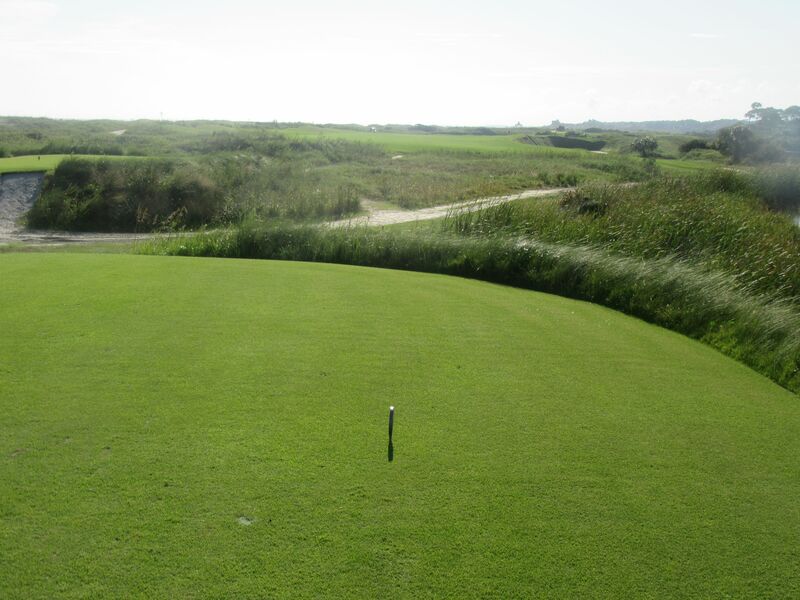 Unlike the Straits course, there are no “Throw-away holes” at the Ocean course. The fifth at Whistling Straits is the one hole I’m referring to there. 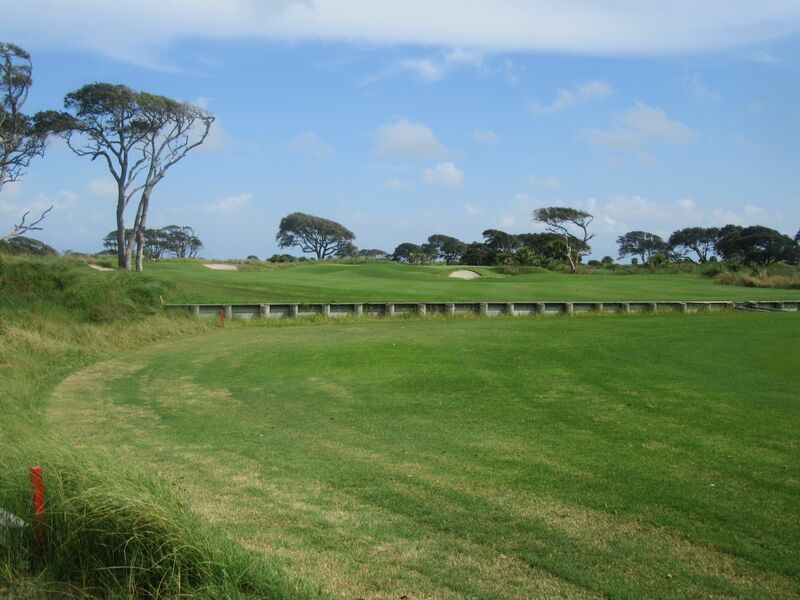 In my opinion, it does not fit the rest of the [otherwise spectacular] course and inserts an opportunity for a colossally high score that can ruin players’ rounds on a long par five where hitting driver off the tee can create a plethora of issues including lost balls. 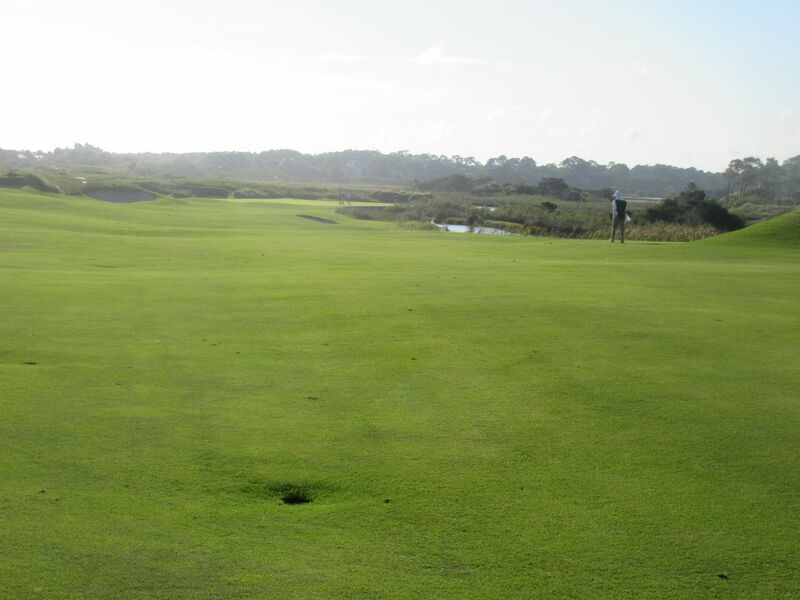 In contrast, there are zero of these contradictory holes on Dye’s Kiawah Island course, and I for one like that. 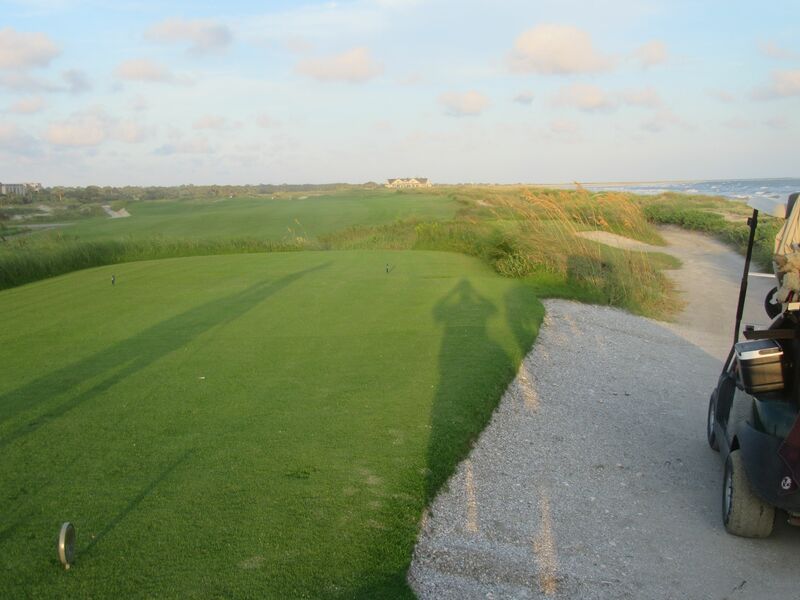 That said, both the Straits and Ocean courses are undoubtedly world-class and deserve each of their lofty state, national and world rankings. 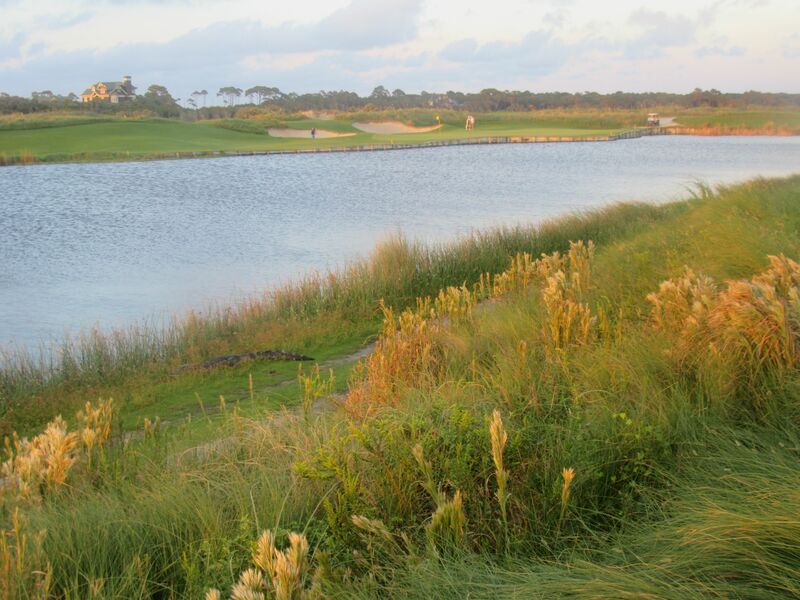 Both courses are also stalwarts for fantastic golf destinations. The Straits course headlines the two Whistling Straits tracks (also including The Irish), the Meadow Valleys and River course at Blackwolf Run, Pine Hills Country Club (private) and The Bull at Pinehurst Farms, while Kiawah Island has terrific complementary courses including Fazio’s Osprey Point (soon to be reviewed) and River course (private), Gary Player’s Cougar Point, Jack Nicklaus’s Turtle Point, Clyde Johnston’s Oak Point, and Tom Watson’s Cassique (private). Kelly and I spent an afternoon at Osprey Point and loved it, and from driving past the others for five days in a row we can’t wait to get back for Honeymoon 2.0 to see and review the rest. 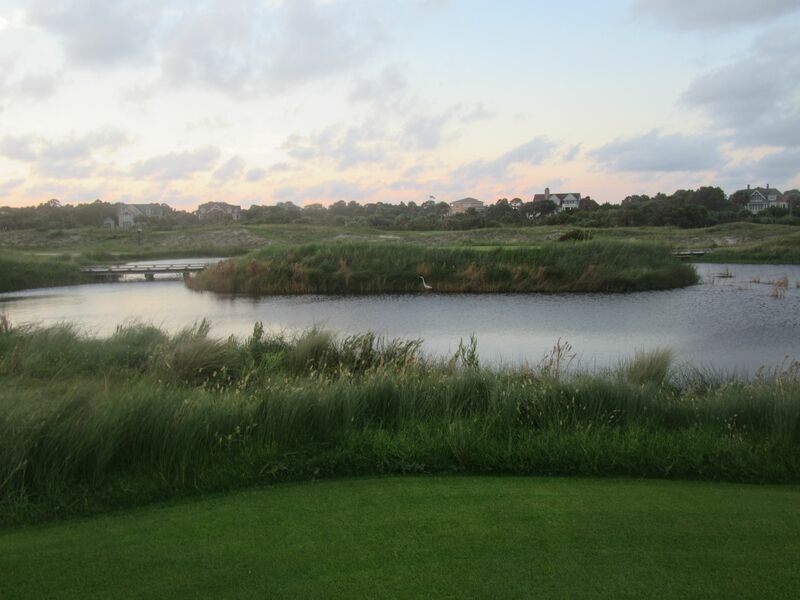 Kiawah Island was a wonderful golf destination, and an awesome spot for the first five days of our honeymoon. The food and golf were fantastic, and there was so much to do including all the pools and beaches, an incredible spa, great shopping and seemingly endless options for dining and drinks. Kelly and I were fortunate throughout our wedding and honeymoon: It was supposed to rain all day for our outdoor wedding on September 24 at North Hills Country Club in Menomonee Falls, Wisconsin – it never did and was perfectly comfortable; it was supposed to rain the entire time we were on our honeymoon in South Carolina – it rained for a couple of hours after we landed and we then had 80’s and nothing but sun until we left. Within 36 hours of getting home to Wisconsin, both Kiawah Island and Charleston had been evacuated because of Hurricane Matthew. We never saw any of that weather system and hope everyone there is safe and unaffected. We’re less than a month in to our marriage, but if we can keep getting this fortunate we sure won’t complain. 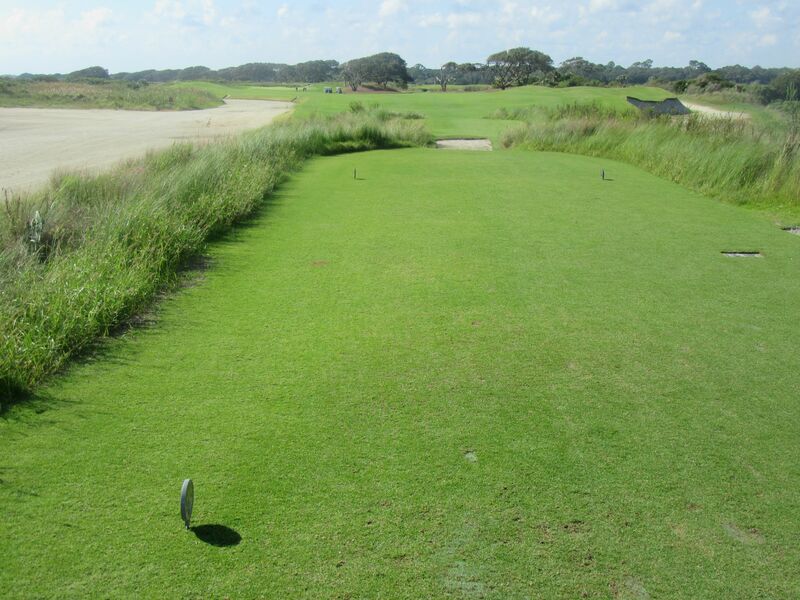 Pete Dye’s signature course at Kiawah Island is phenomenal. If you have the opportunity and finances to play it, play it. Splurge for a caddie or forecaddie, too, and make sure to ask for Andy. 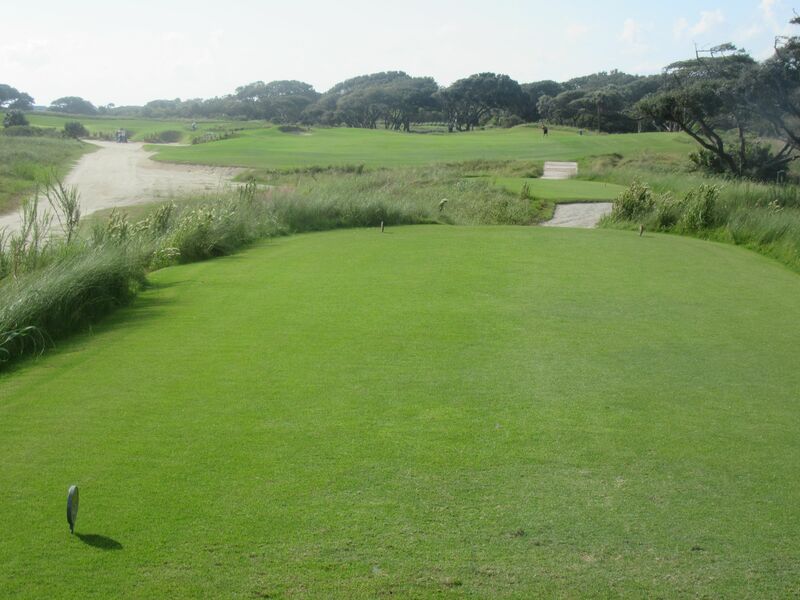 As far as true golf experiences go, there are few tracks I have played that can compete against the Ocean course at Kiawah Island. Wow, you did a great job on the review and I really enjoyed reading it! It was a pleasure meeting you and Kelly and remembering the round. Thanks for including the pictures of us, it was a treat! So glad I have a nice record of our round together. The review was well written and makes me want to go back and try it again! And to check out some of your other reviews! Thanks for the comment, Jerry, we had a lot of fun spending the day with you guys too. If you ever find yourself in the Milwaukee area looking for a round of golf, let me know!